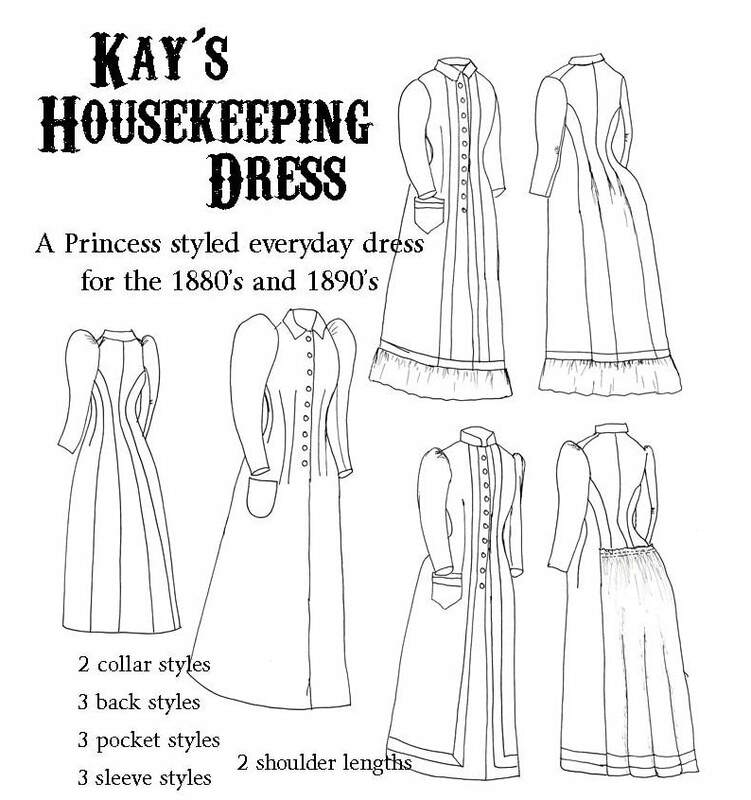 ​I am currently offering this pattern as part of my indiegogo campaign- Patterns for the Everyday Victorian to be able to afford a new printer/scanner as an upgrade from my blueprint copier. 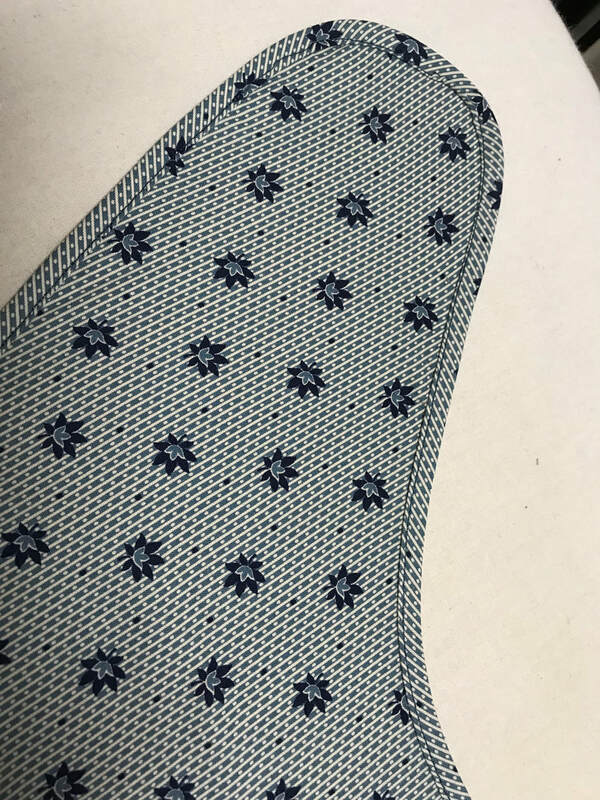 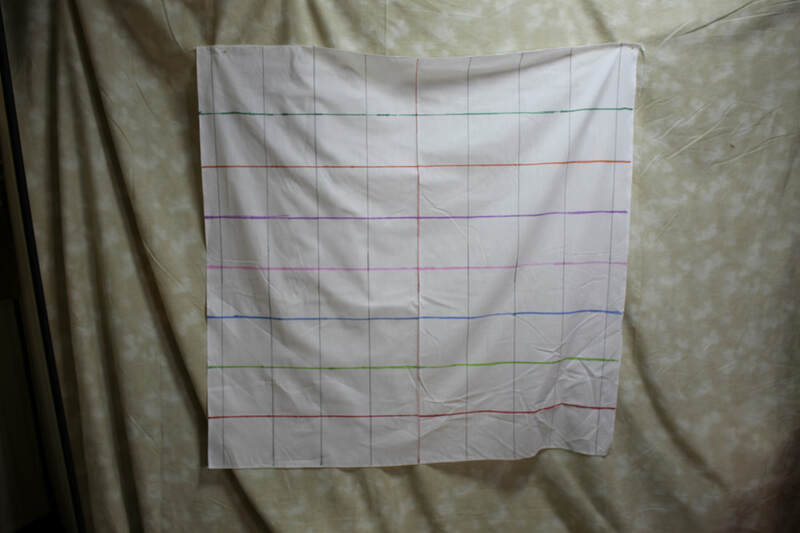 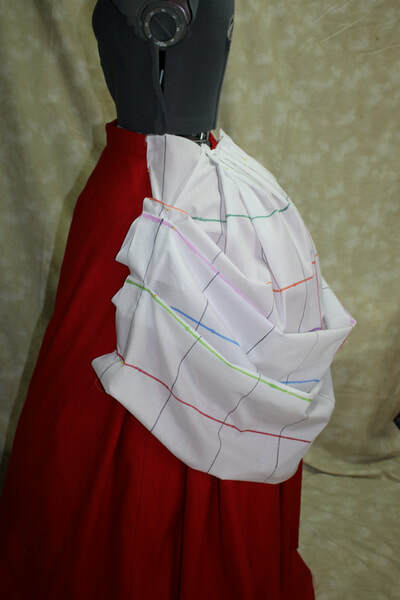 When I began drafting this pattern my goal was a good basic pattern that was useful for ladies doing impressions of middle and working class ladies. 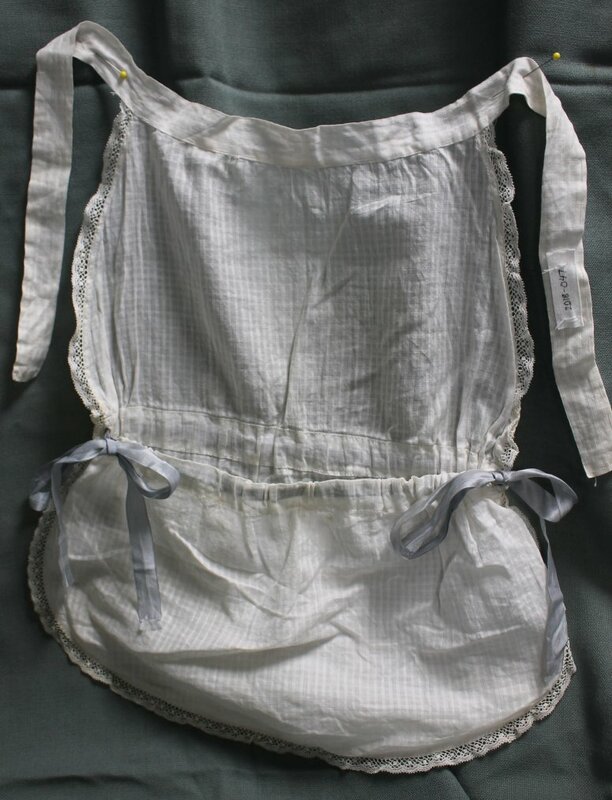 Something that they could do their housekeeping chores in or be at ease on a summer day. 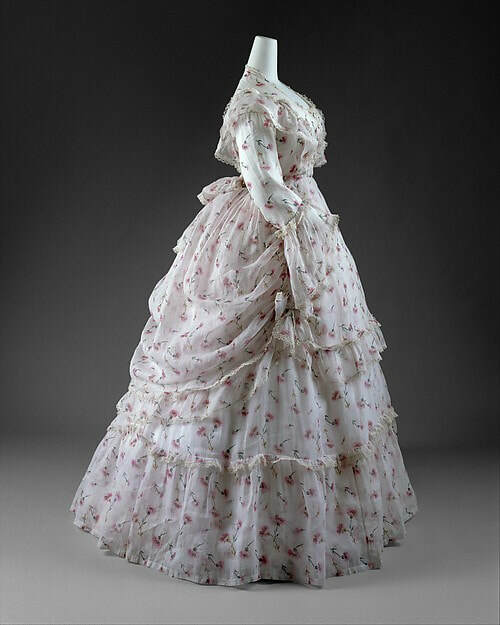 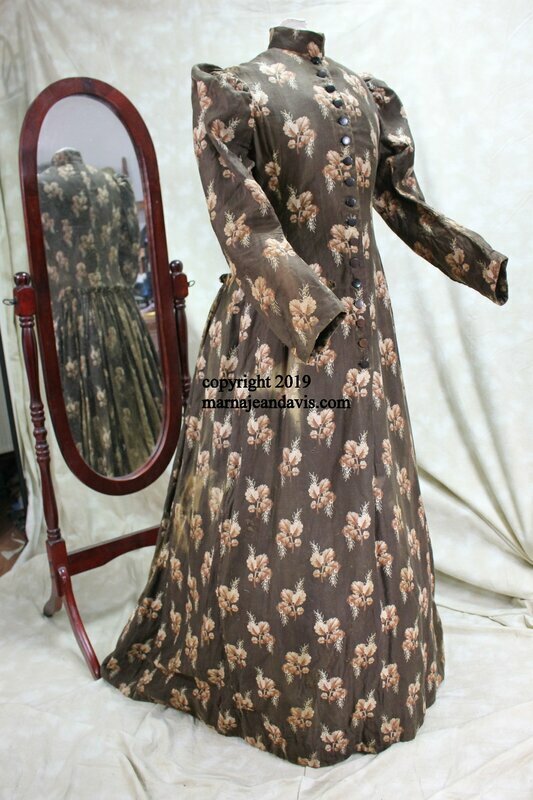 ​The first dress I looked at in my collection was one that matches patterns from the 1880's in both Butterick and Demorest fairly closely. 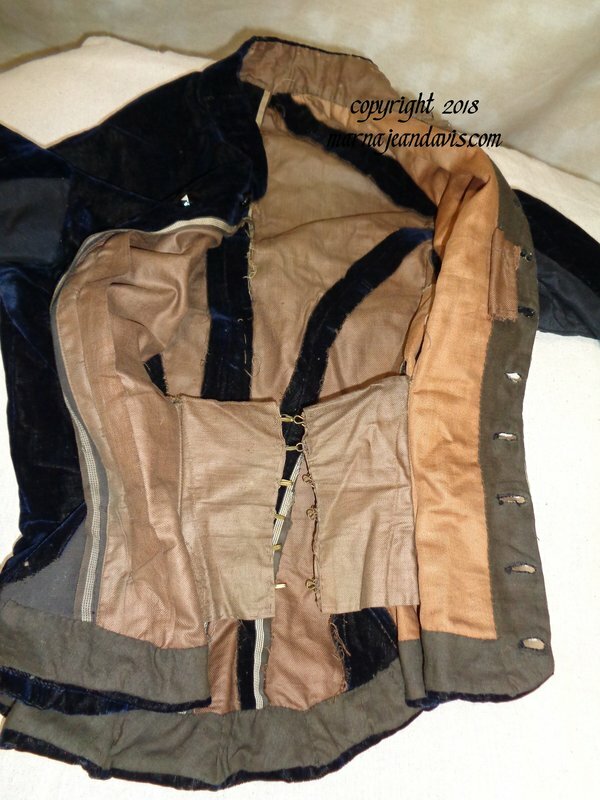 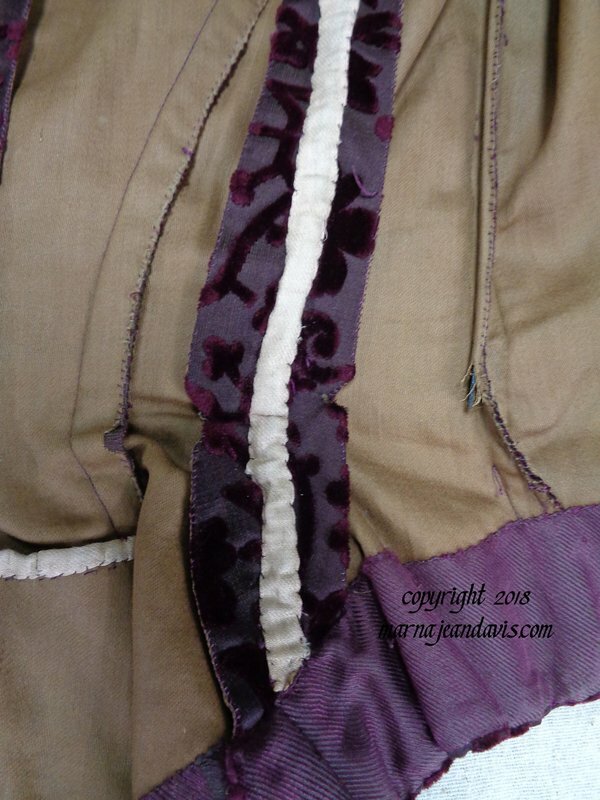 It was well made, but definitely created by the home seamstress- using scraps from another dress to create the half lining in the bodice, and the hem at the skirt. 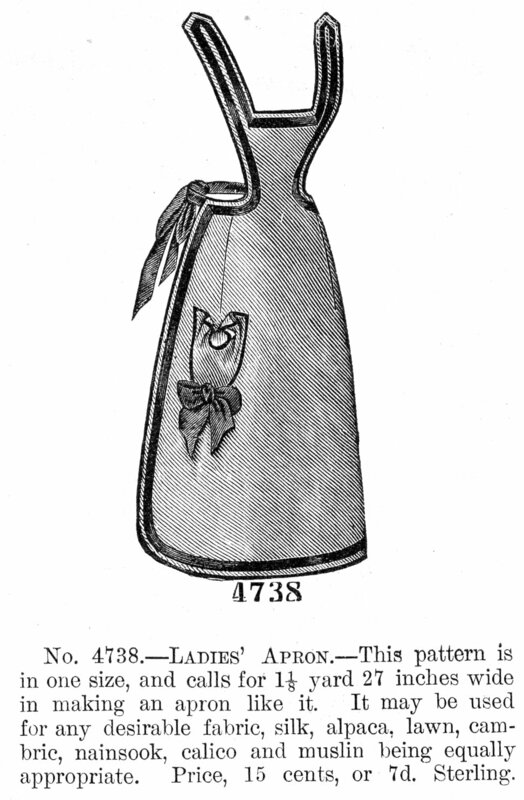 One of the key things about this dress is its extensive use of machine sewing. 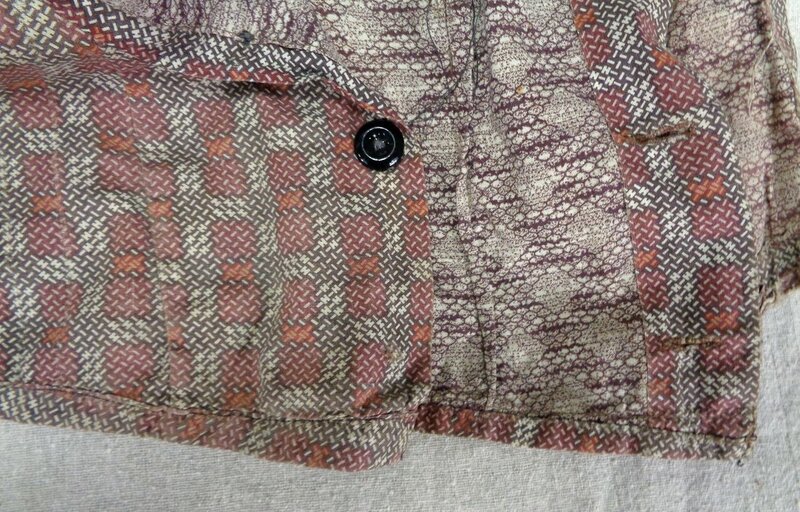 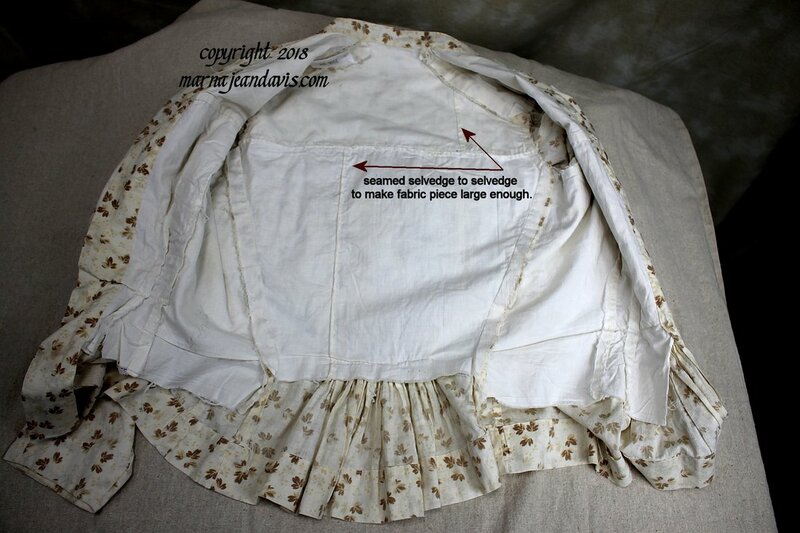 There is very minimal hand sewing on it. 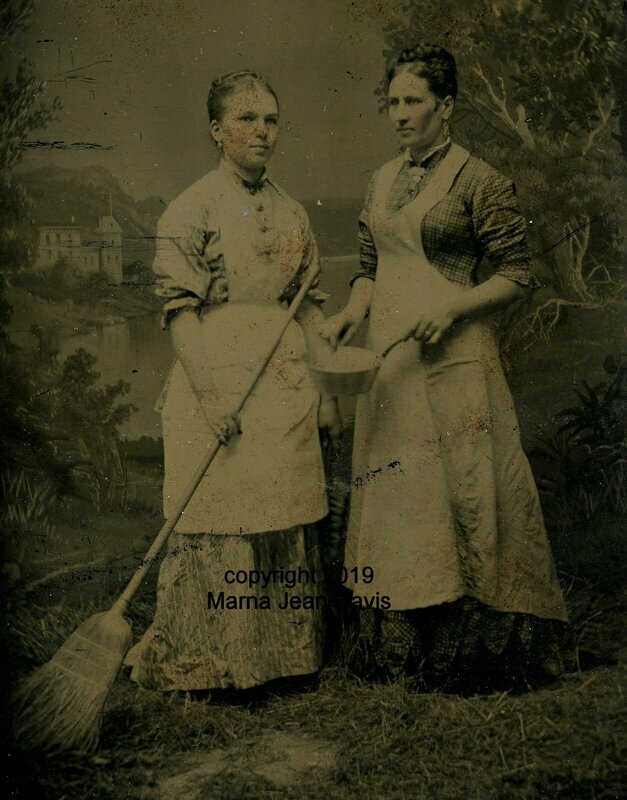 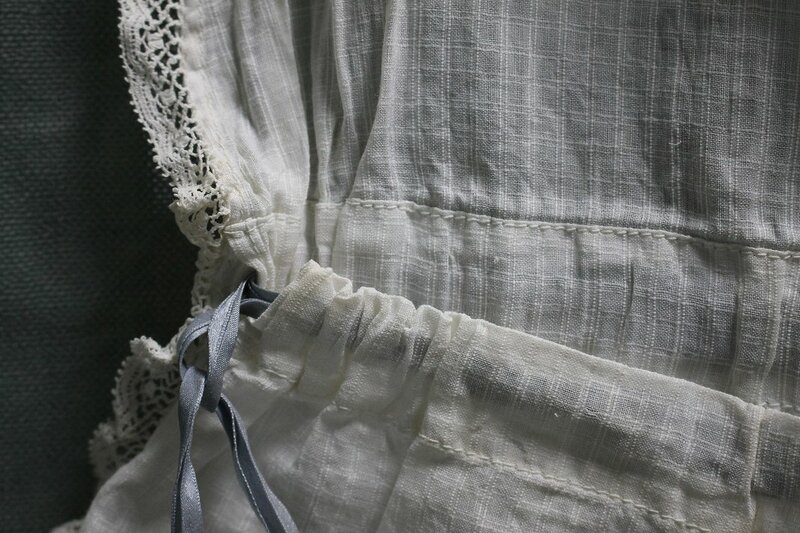 Another point making it a good dress for household chores is the fact all trim is "sturdy." 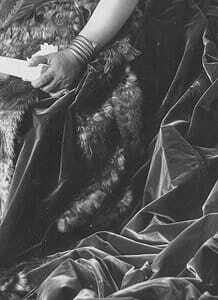 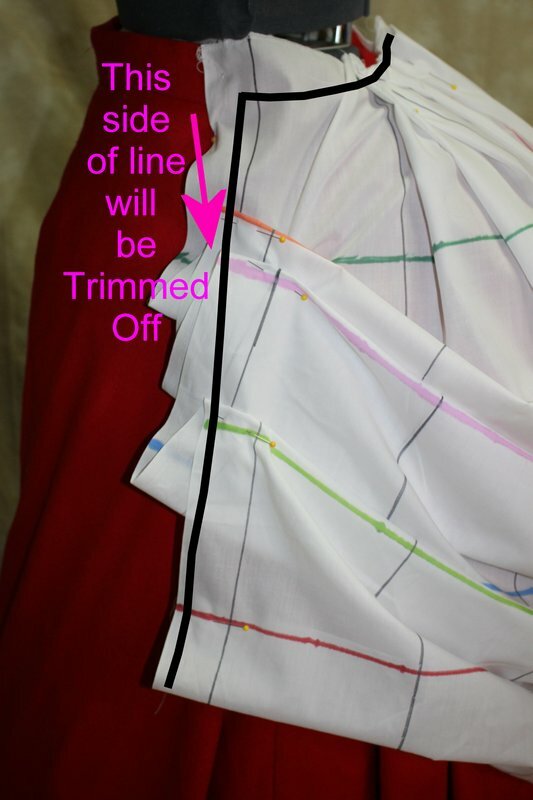 The trim on the dress is a printed fabric rather than a braid or lace that has been applied flat by machine to the dress. 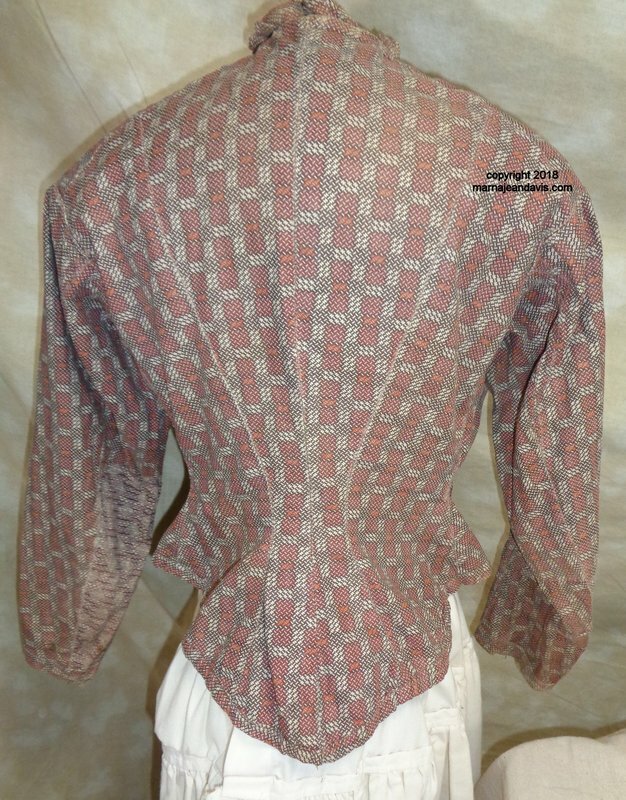 This is an easy replication done by choosing a historic reprint with a striped pattern and cutting it up into strips for the same look. 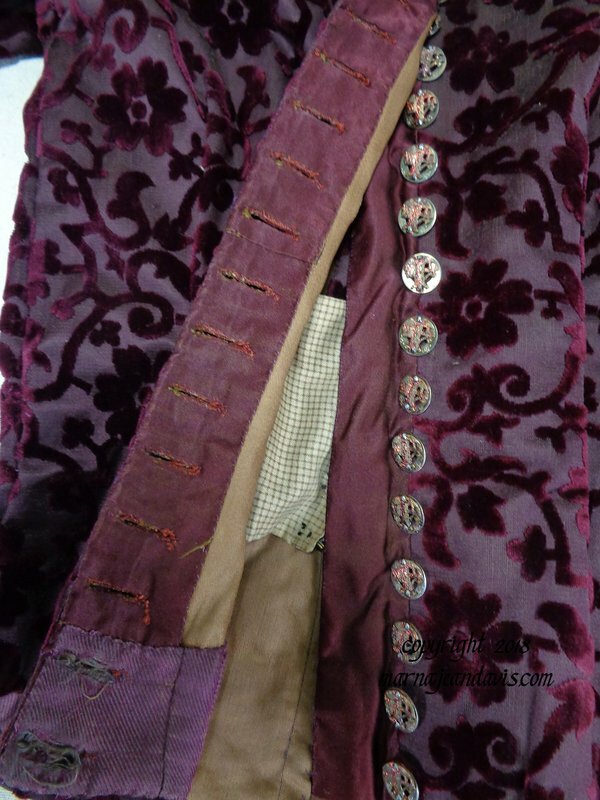 Historical notes are an important part of my pattern. 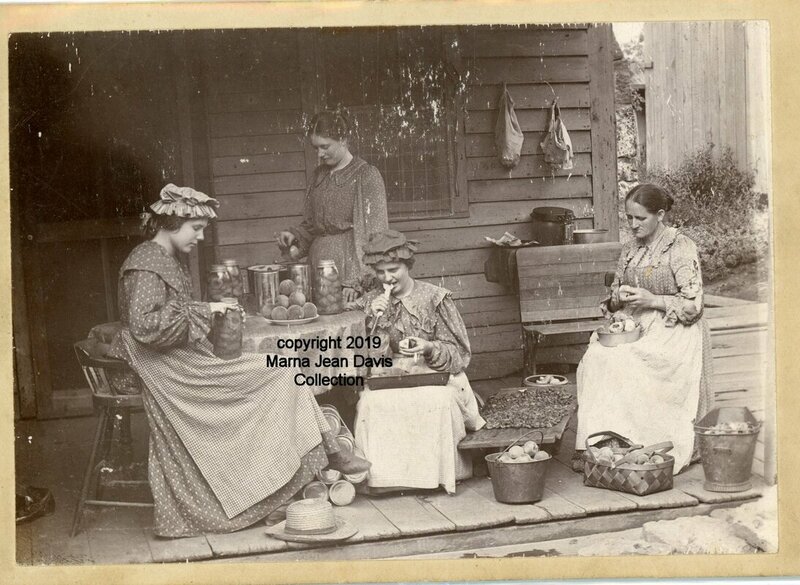 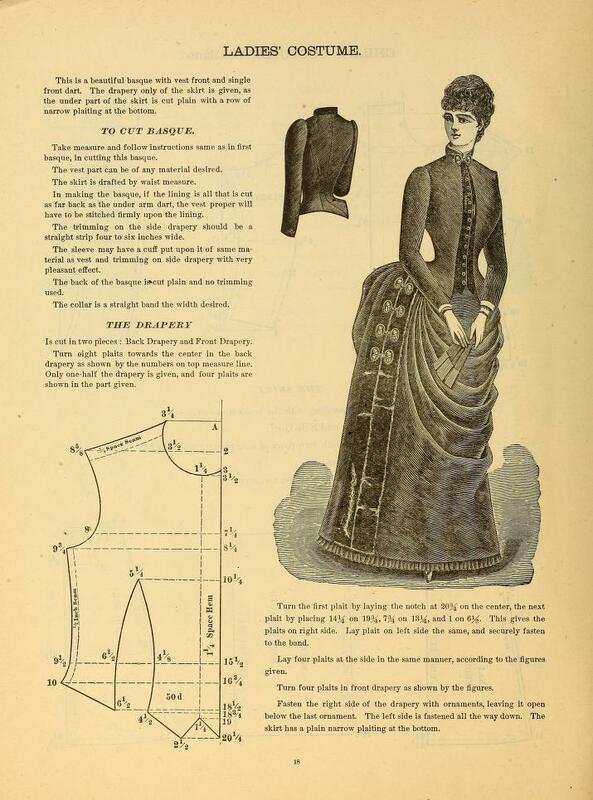 In it I talk about many of the shortcuts in sewing used by the woman making workwear in the late Victorian timeframe. 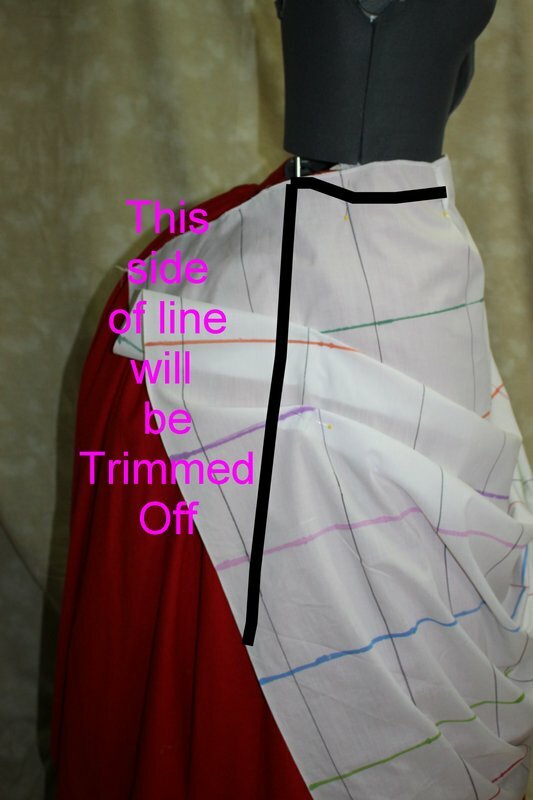 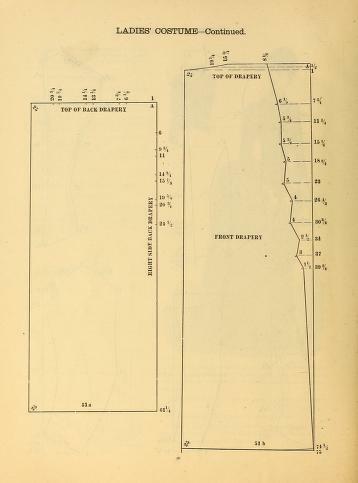 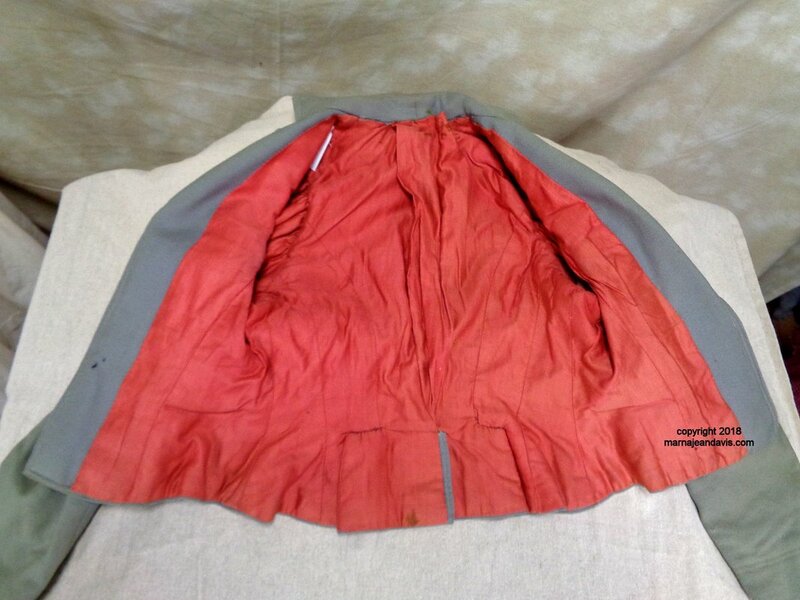 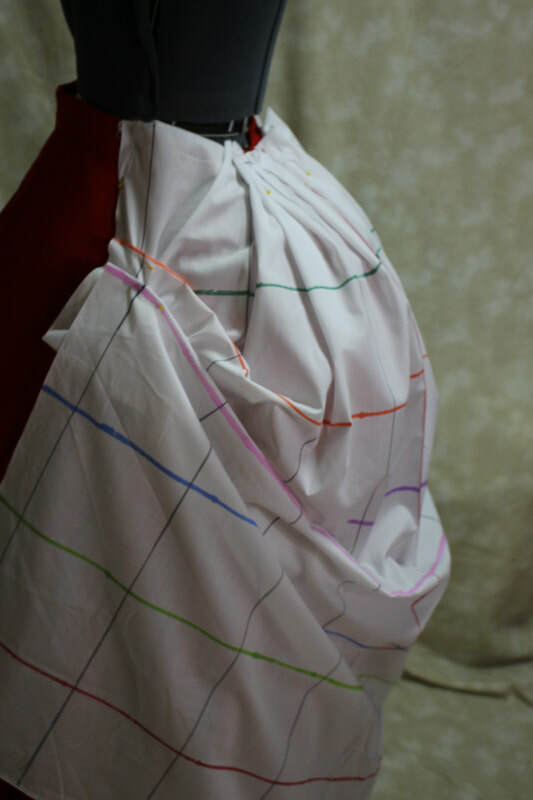 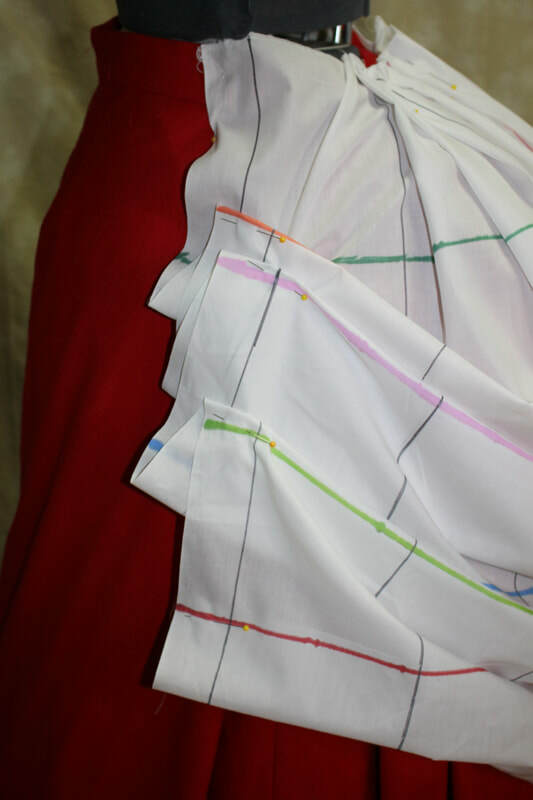 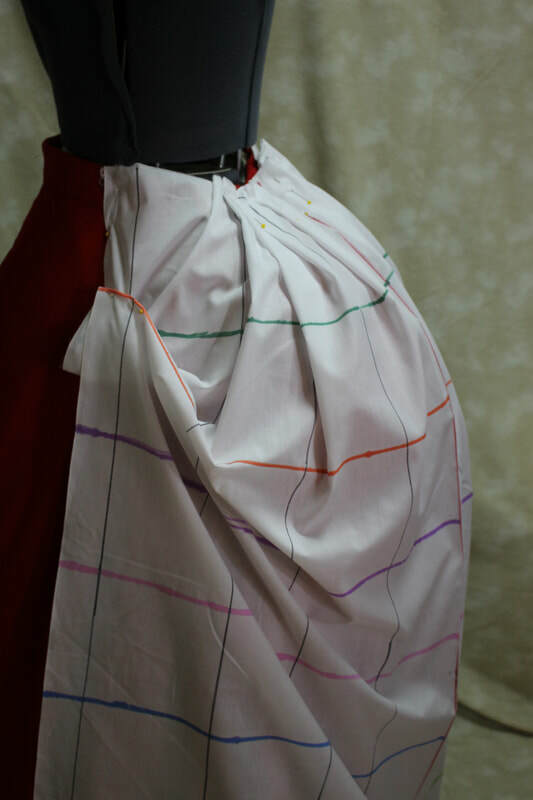 This image shows the half lining in the extant dress- it is not hemmed at bottom and extends to about the hip line. 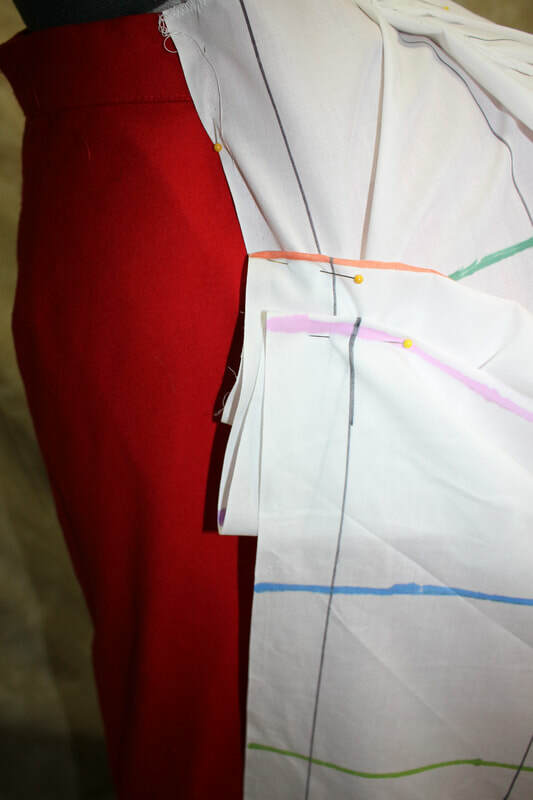 Collar attachment on the extant dress from my collection. Machine stitched hem from extant dress. 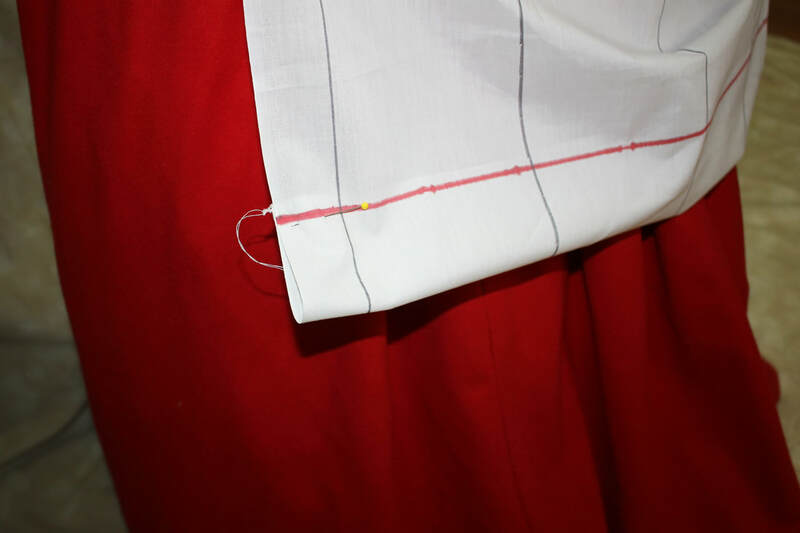 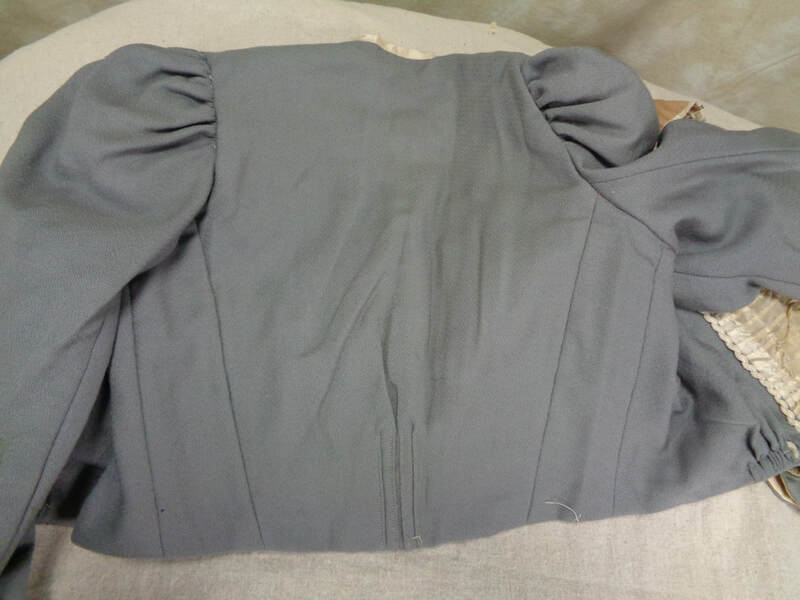 One side of the sleeve is sewn together, the separate hem piece is sewn on and sewn down by machine, as is the trim and ruffle. ONLY then is the second of the sleeve seams sewn. 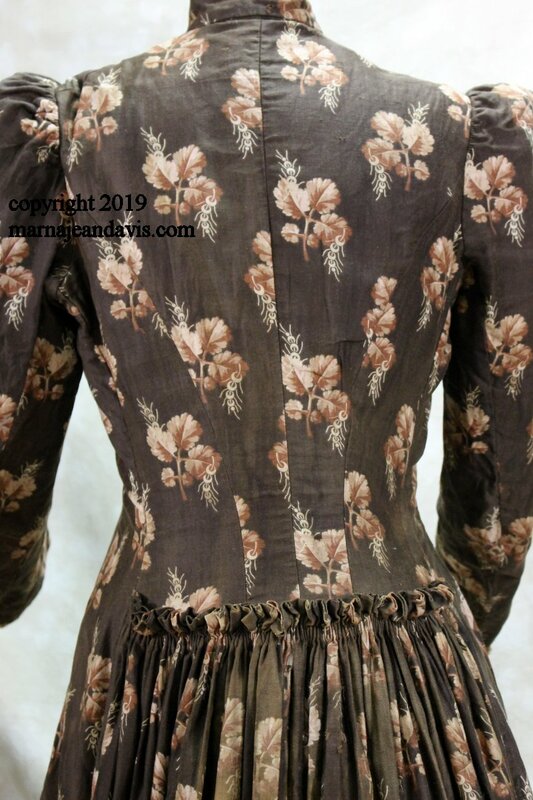 Back view of extant dress in my collection. 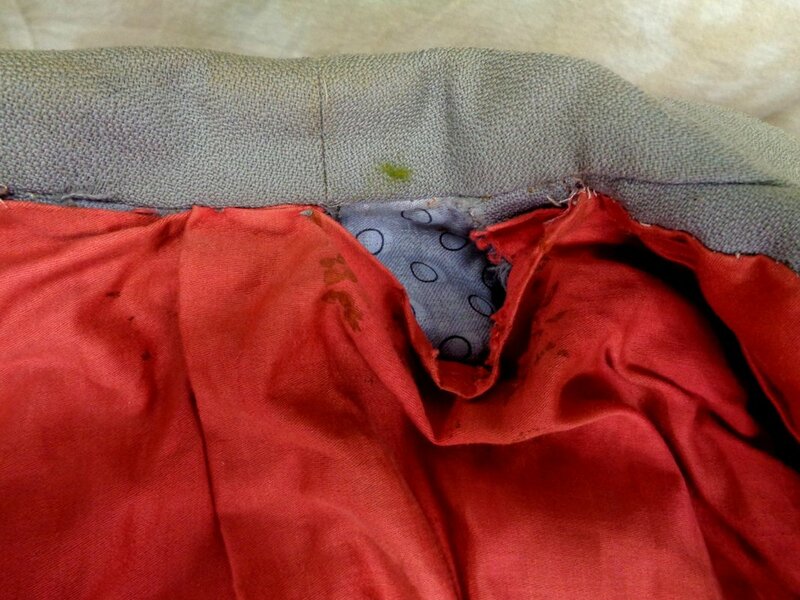 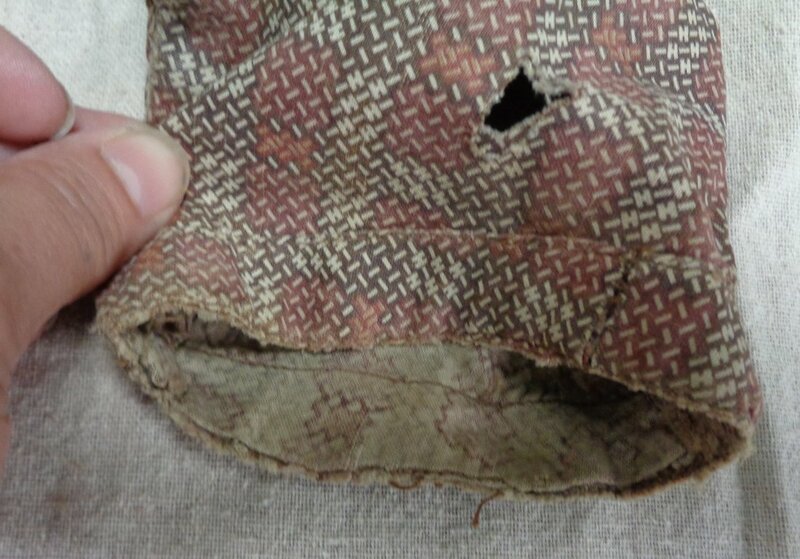 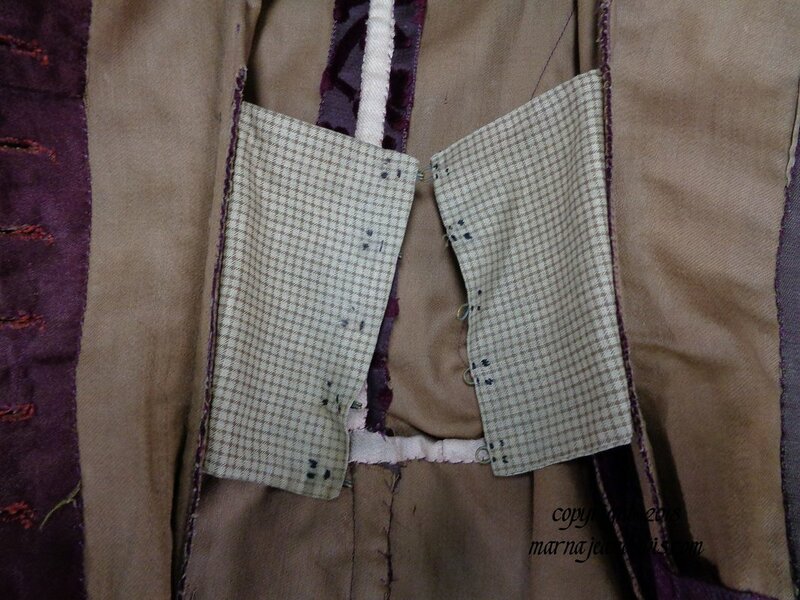 at center back seam and the side back seams. 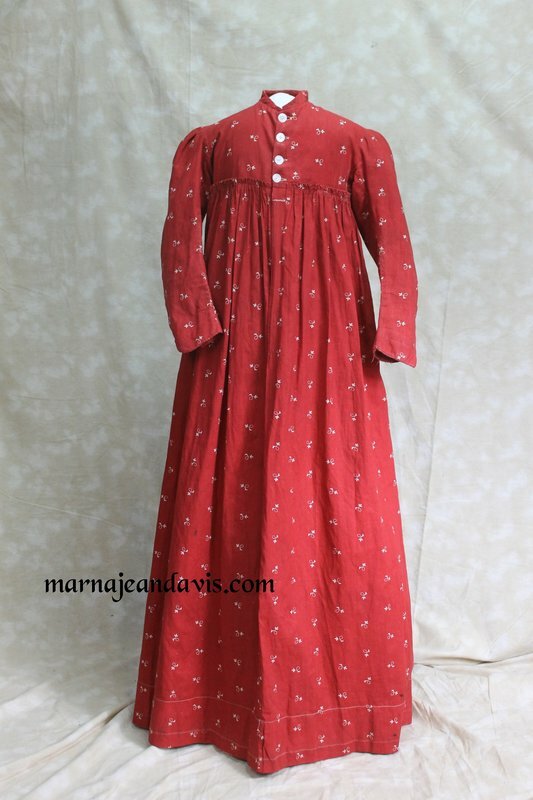 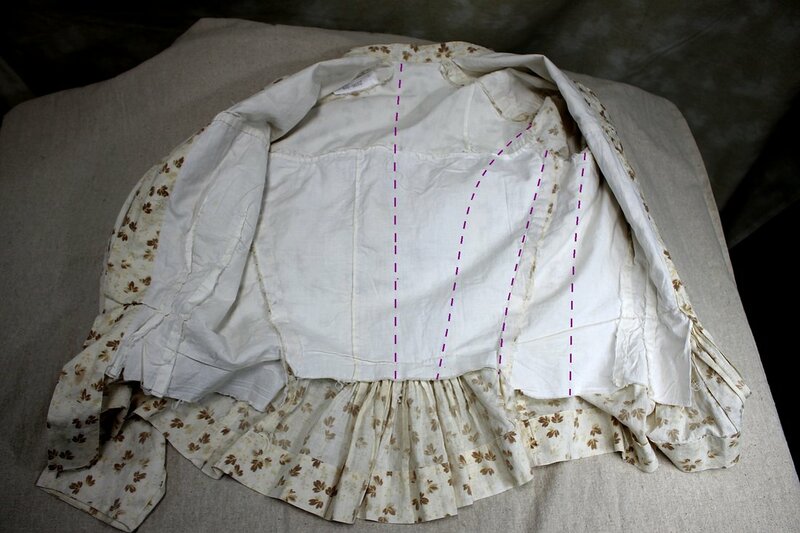 Dresses from this timeframe usually had at least one center back pleat, but the side back ones were somewhat optional. 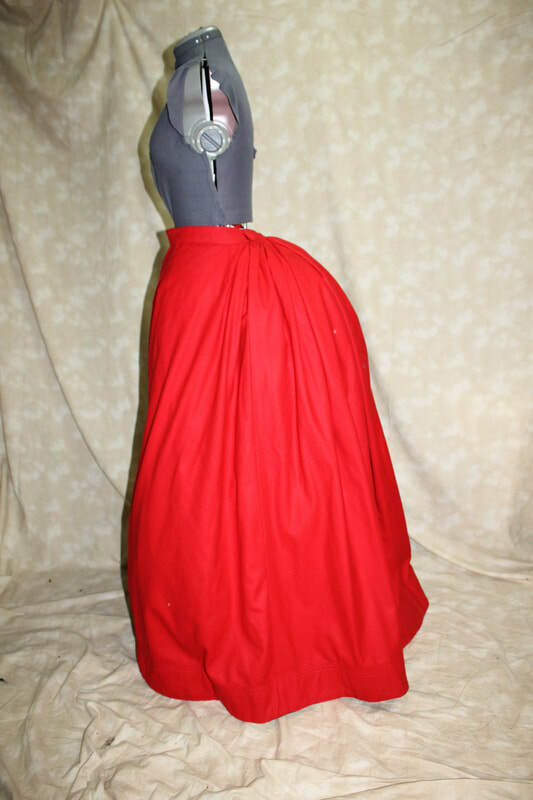 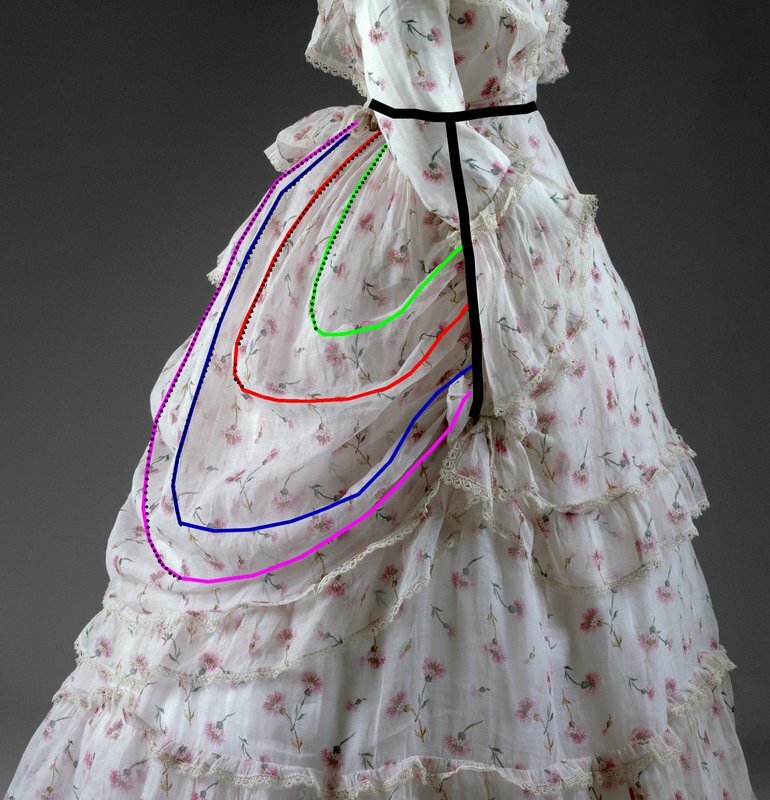 It allowed the skirt to fall over a small bustle and give you movement room. 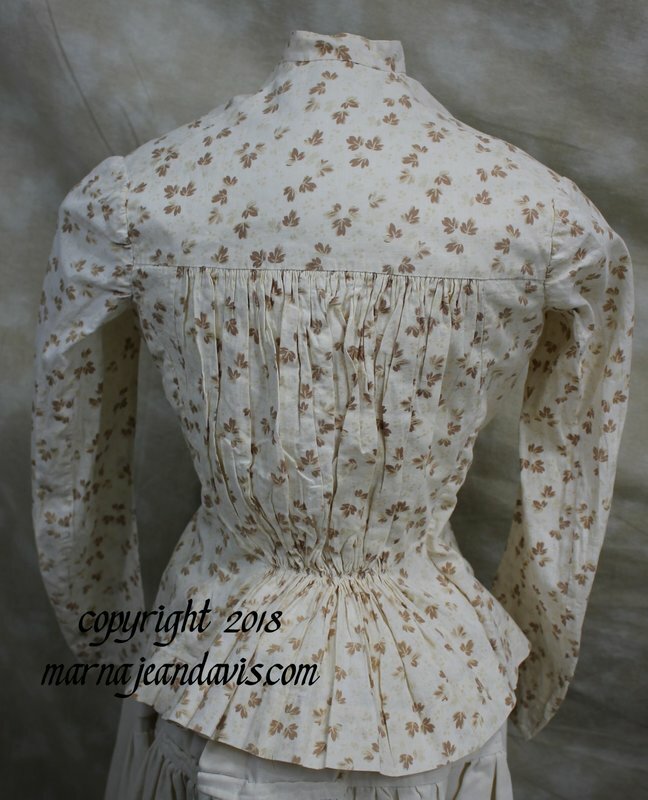 The second dress I took features from when designing the pattern was this cotton sateen dress in my collection. 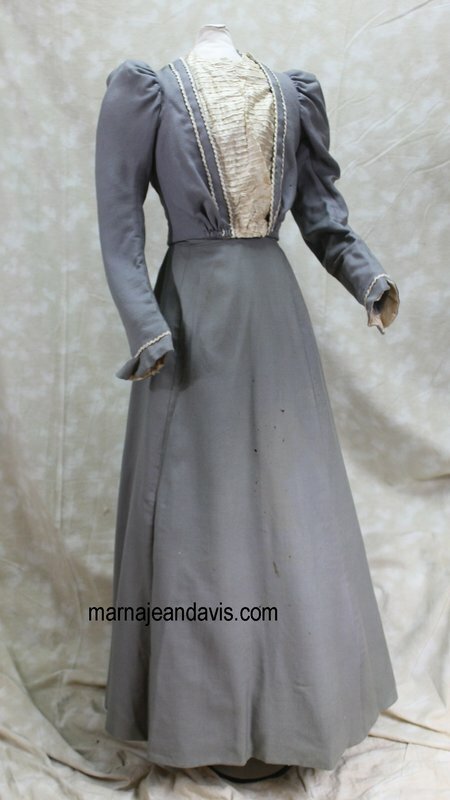 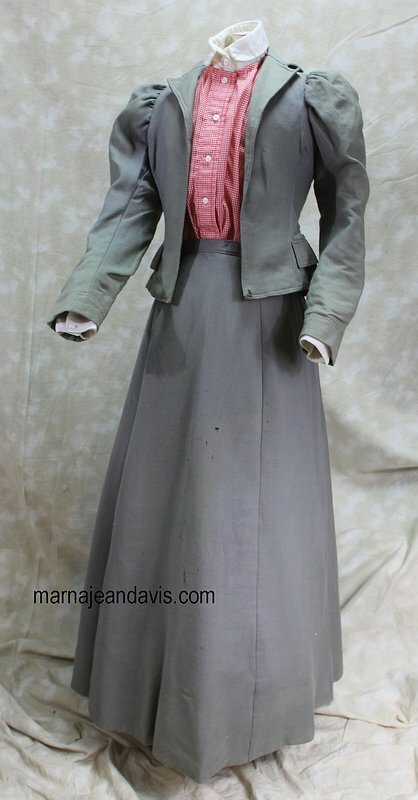 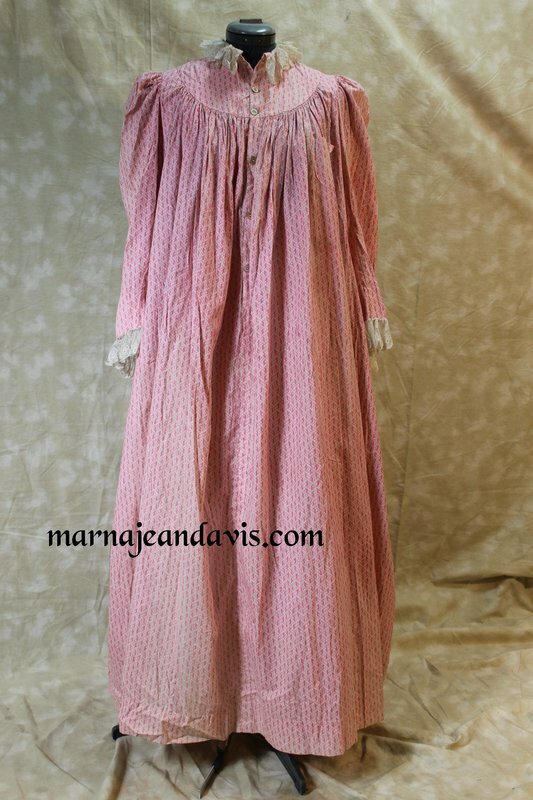 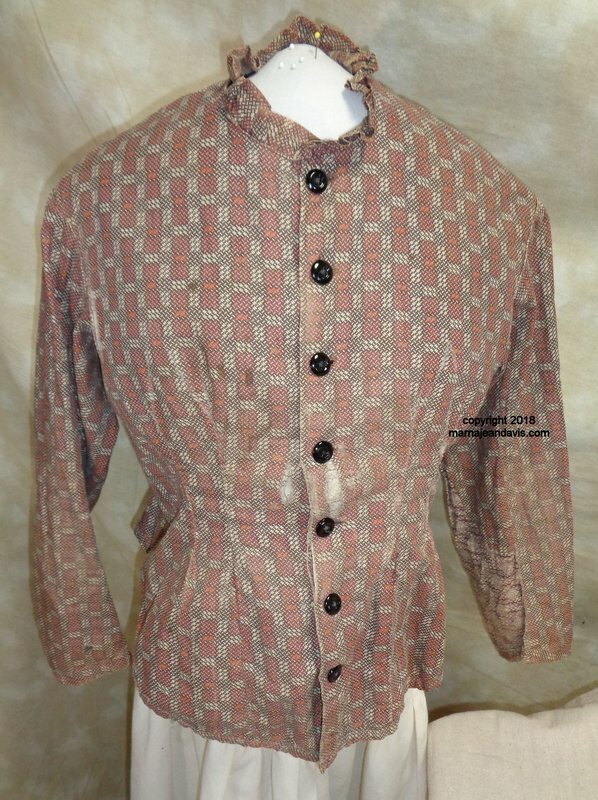 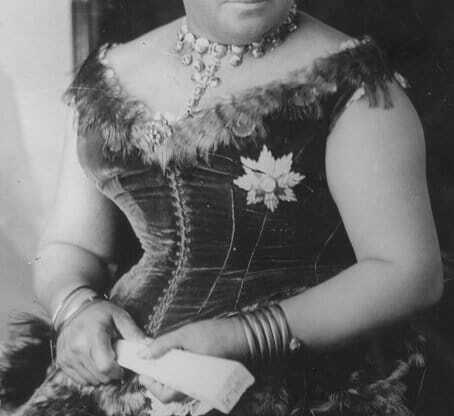 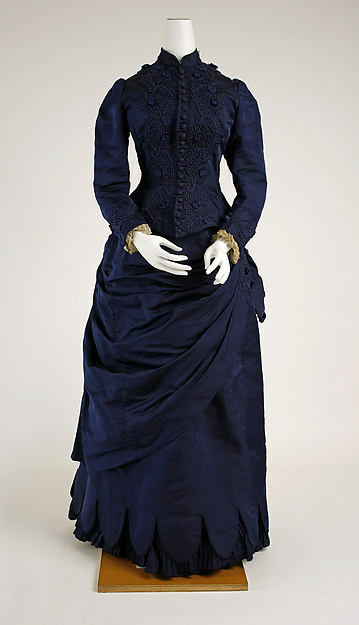 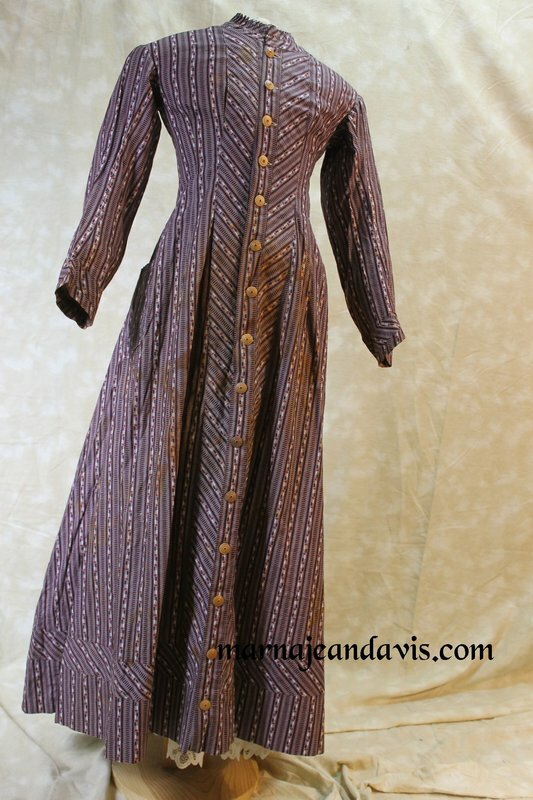 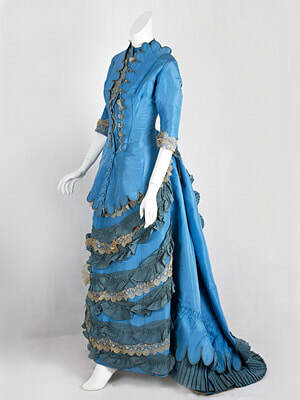 This dress is likely from the first half of the 1890's. 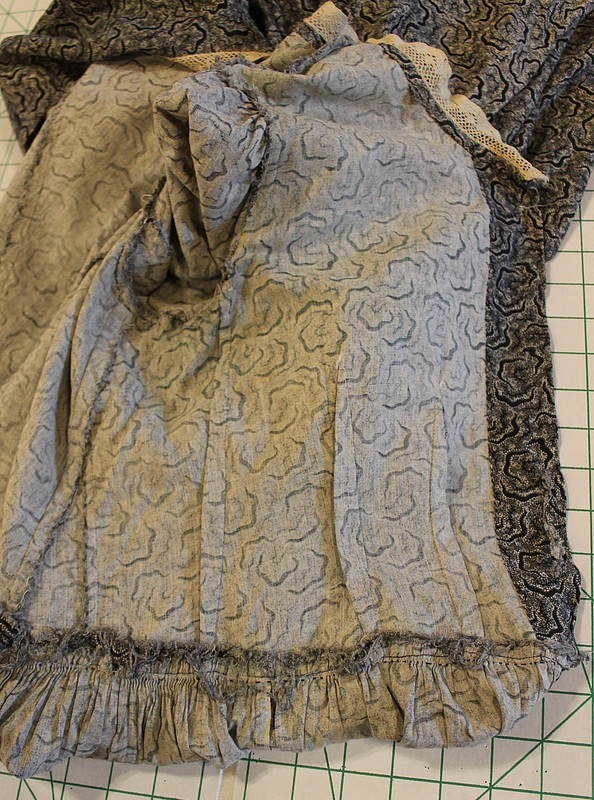 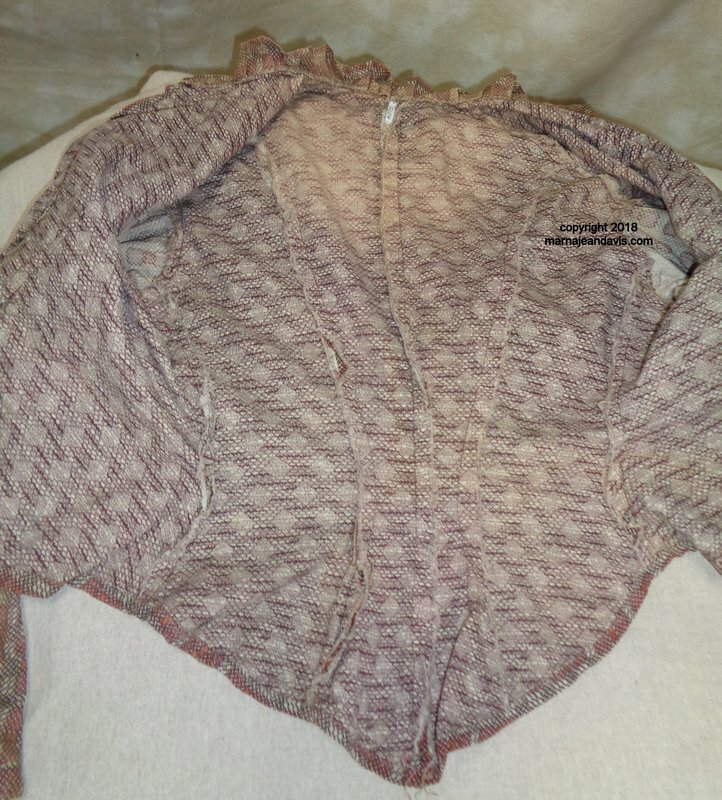 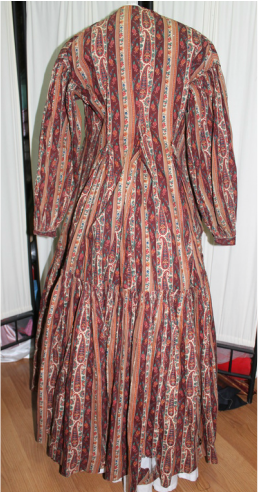 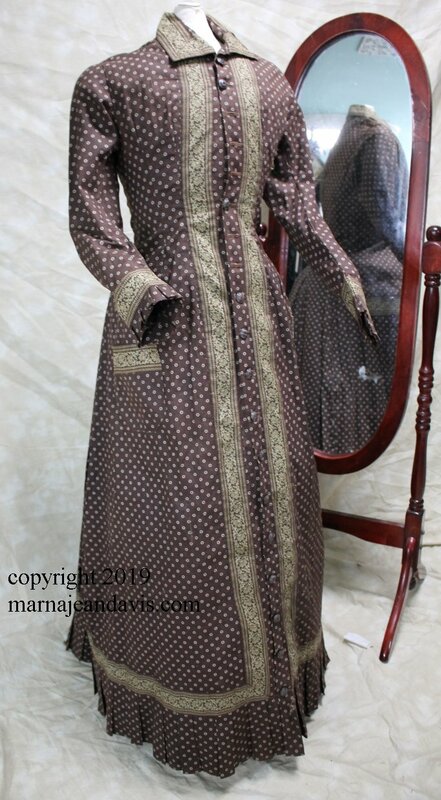 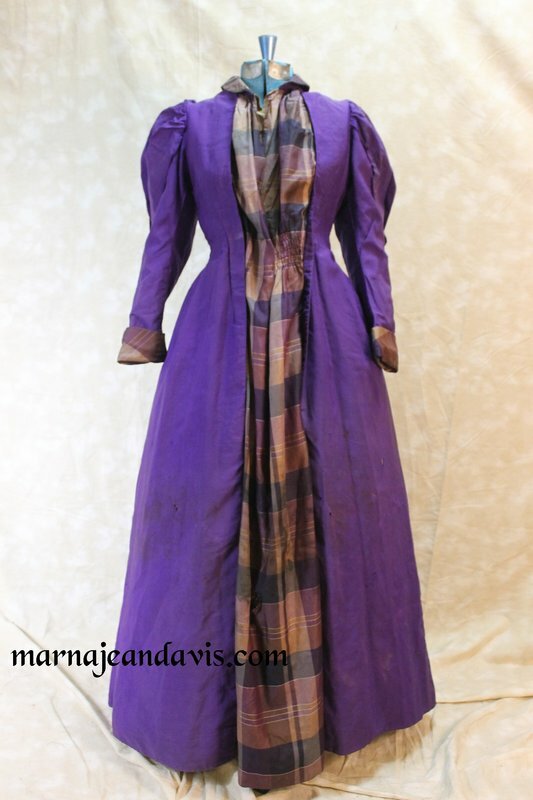 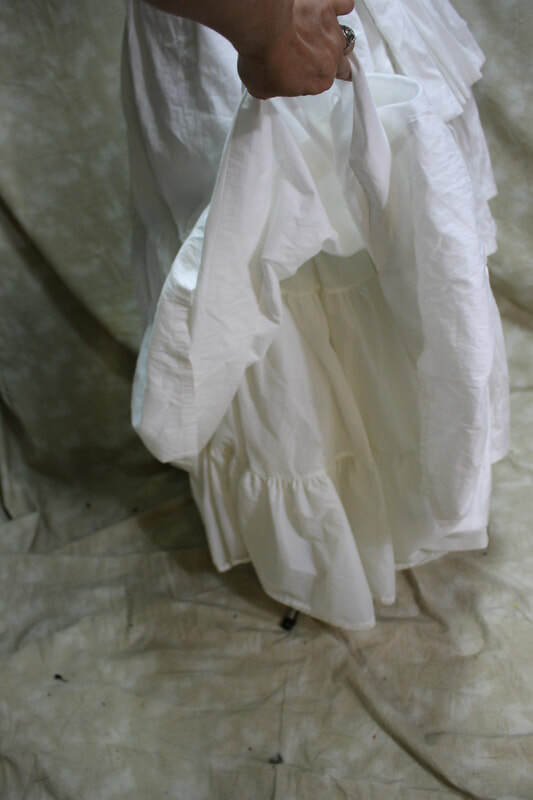 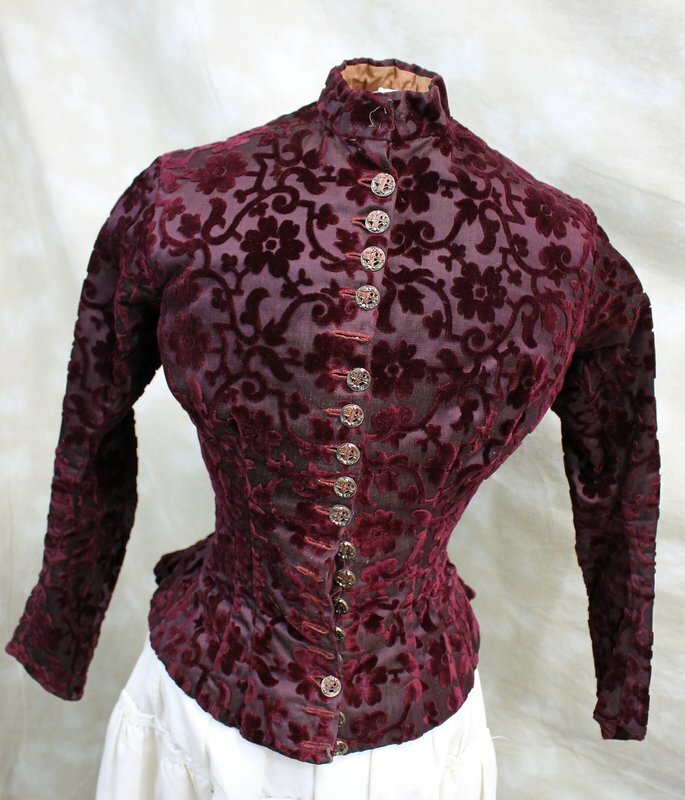 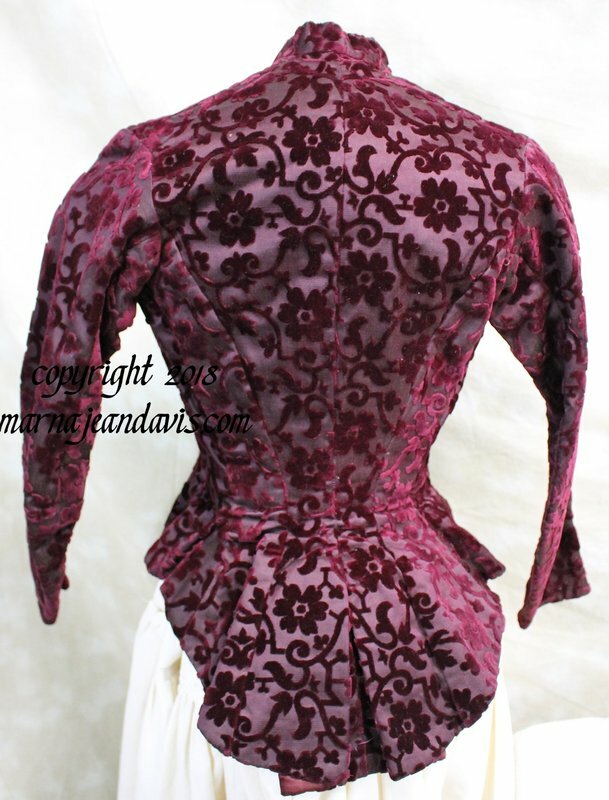 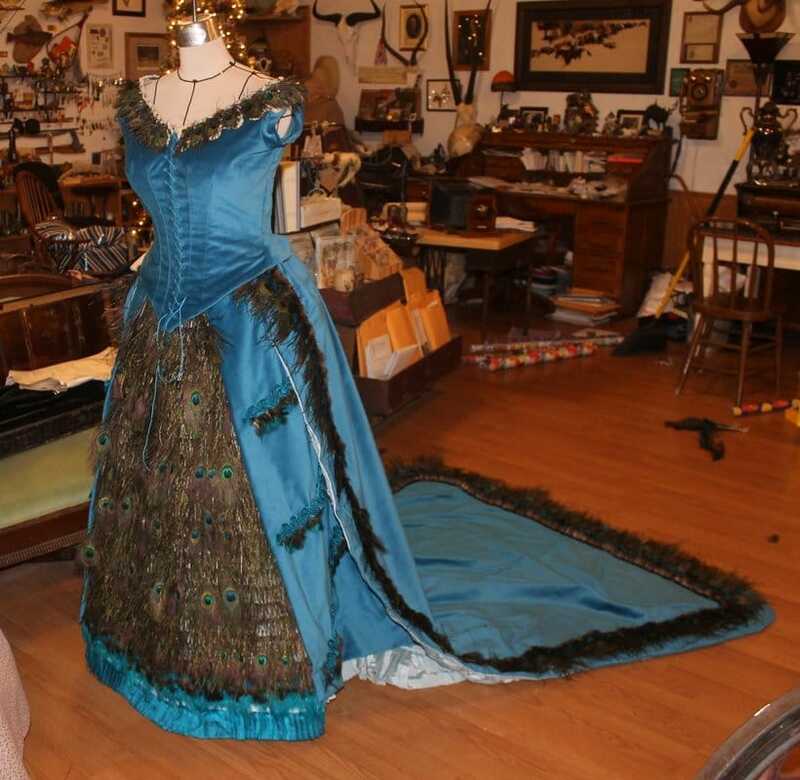 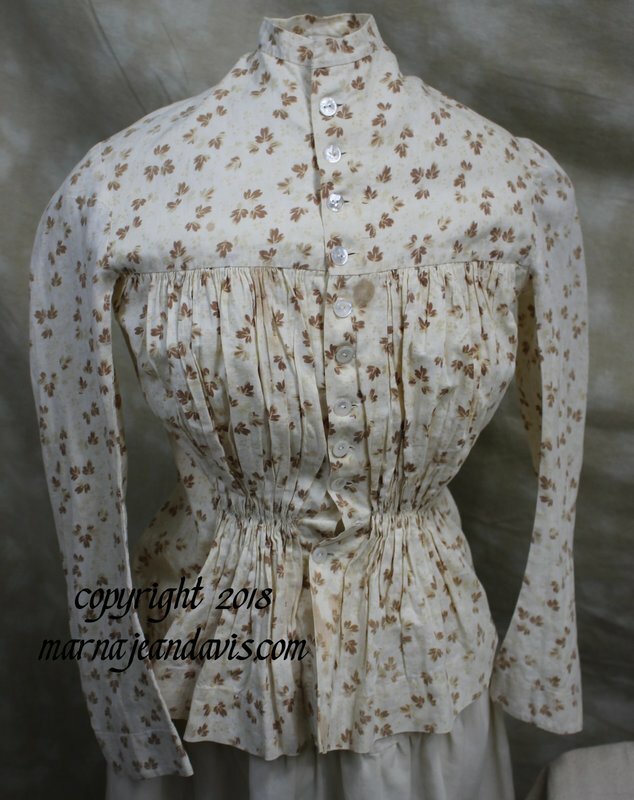 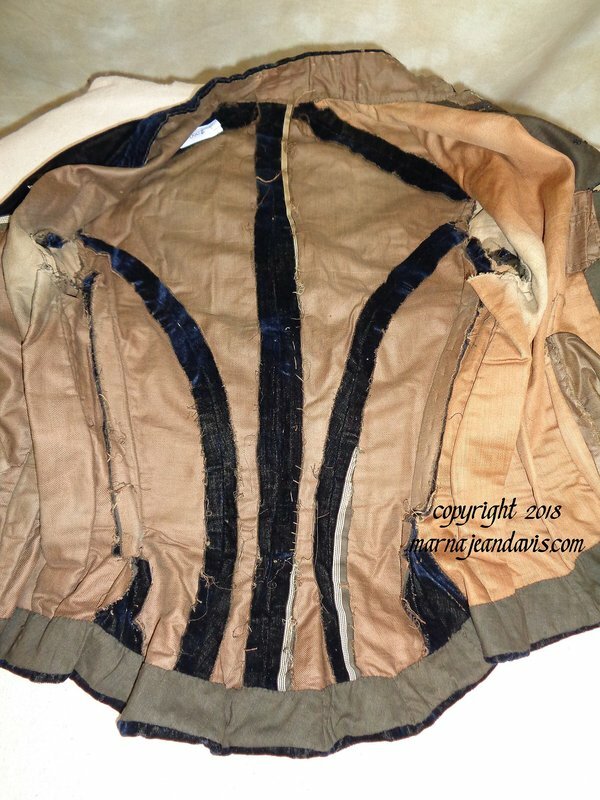 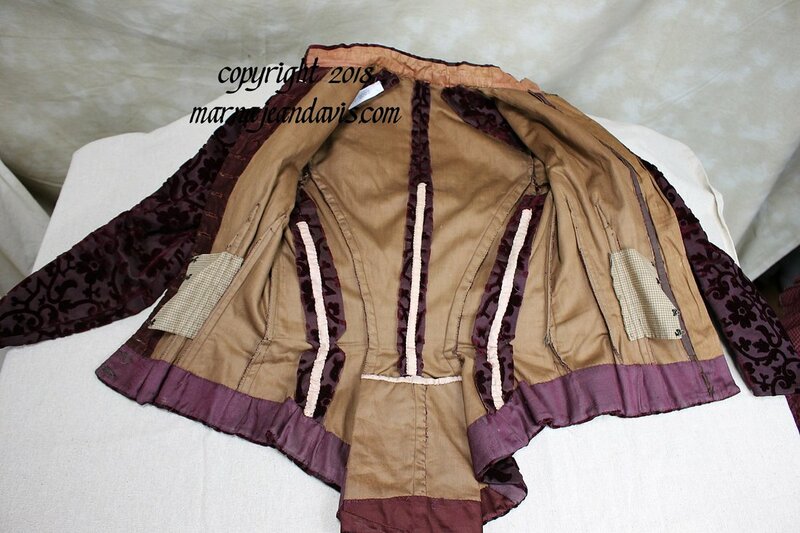 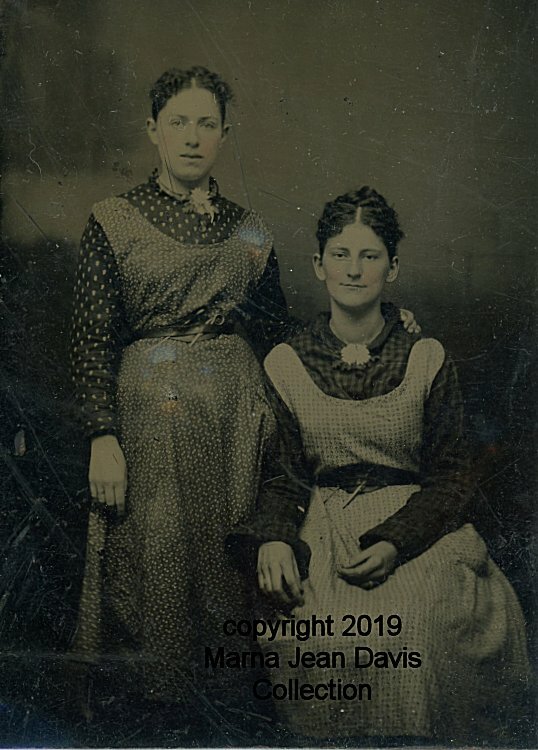 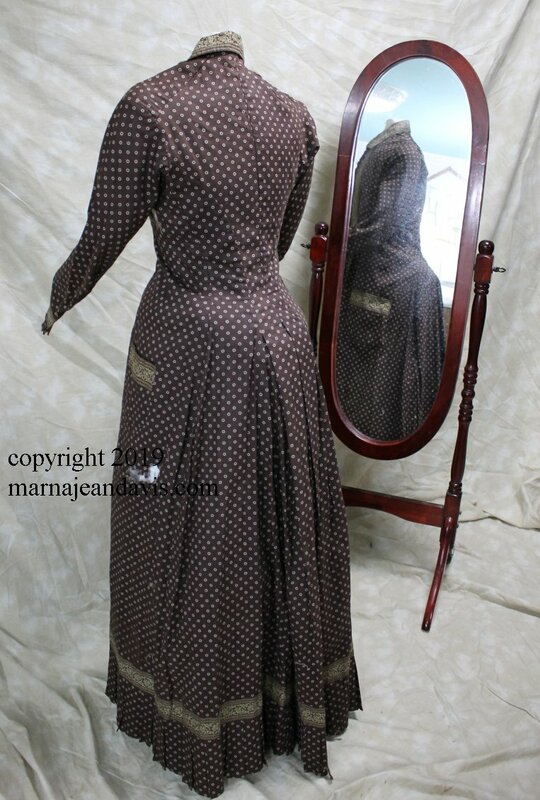 It has the full sleeves of the 1890's, but it has a full width set into the back of the dress from about two inches below the waistline on the back and side back panels. Like most sateen dresses this one is fully interlined. 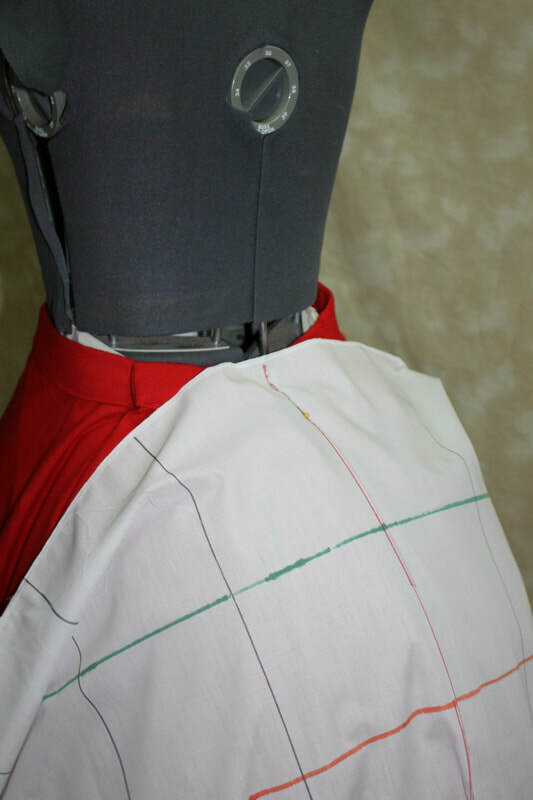 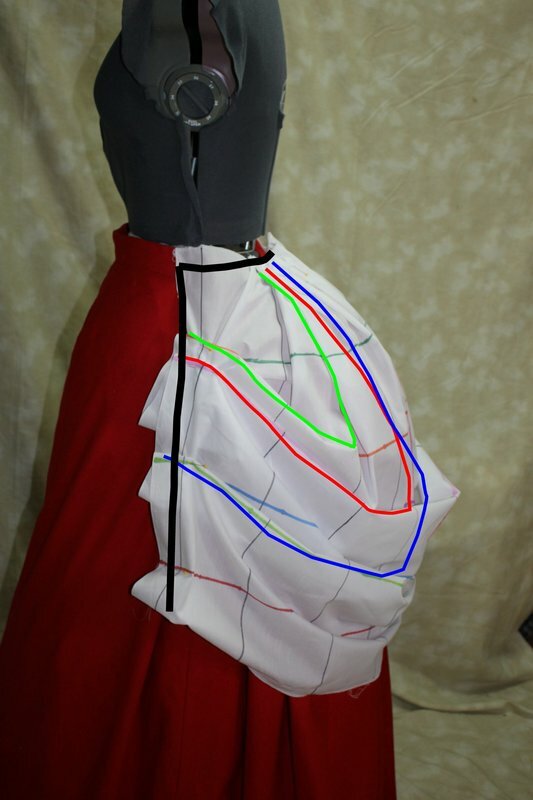 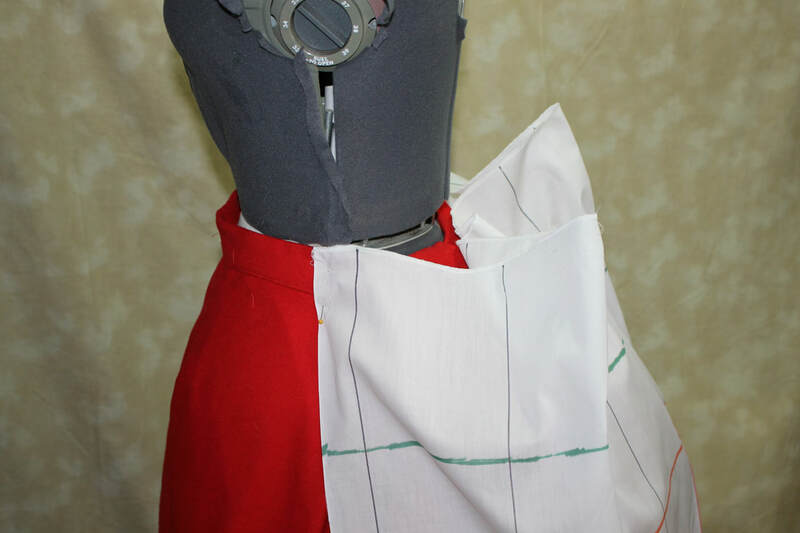 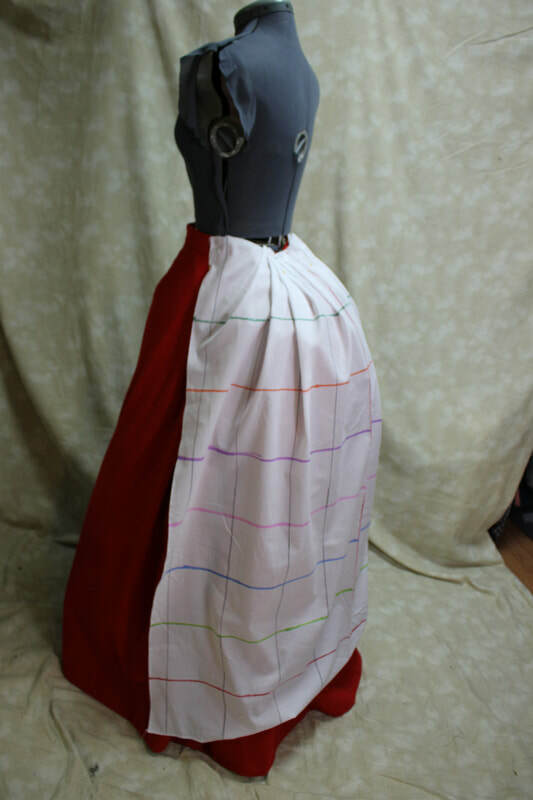 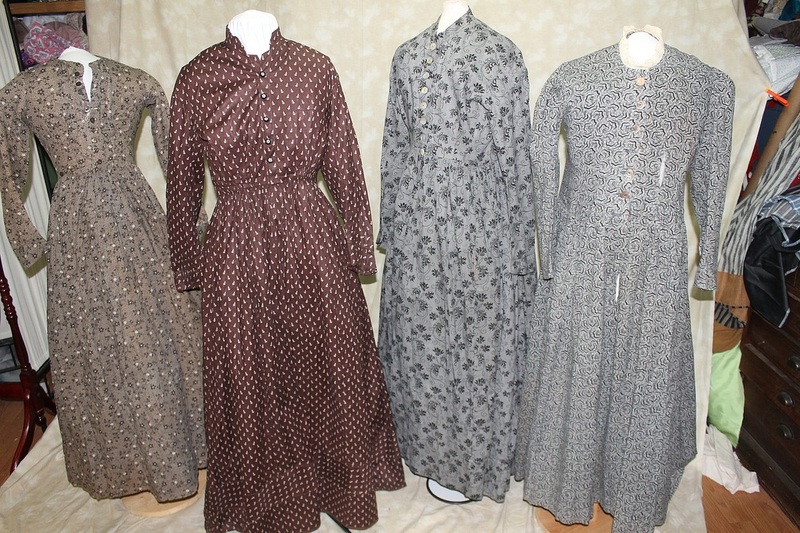 The seamlines and skirt width on the dresses were actually quite similar and it was easy to be able to turn one master pattern into several options using primary sources in my possession. 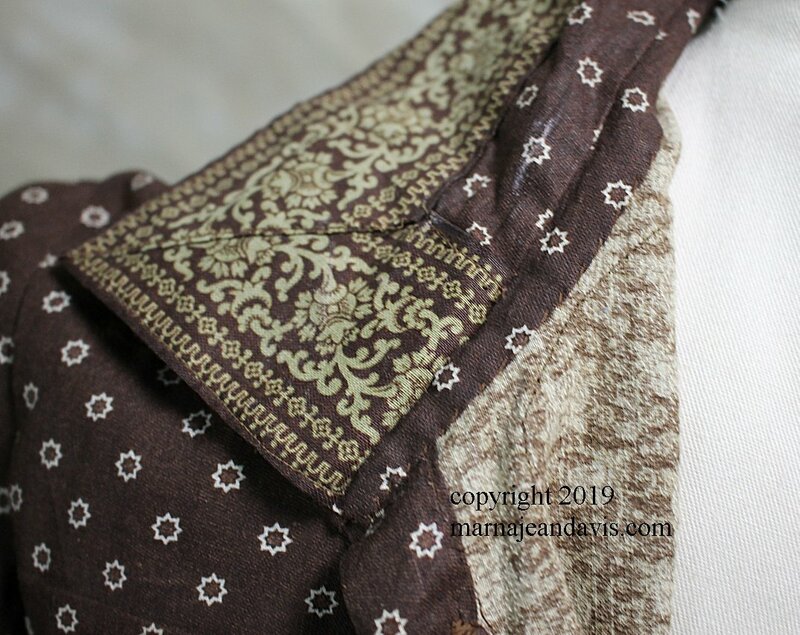 My final pattern ended up with an early 1880's style sleeve, a late 1880's style sleeve, and a practically full 1890's sleeve (full enough to be fashionable, not so full to be in the way). 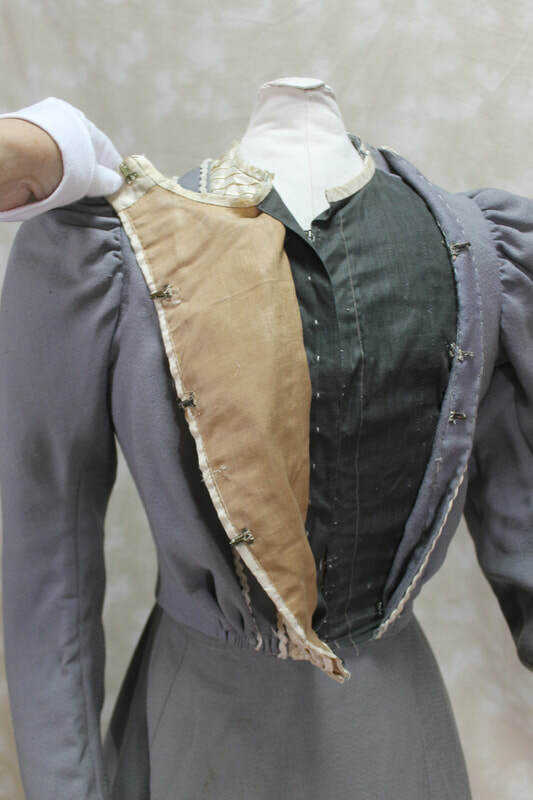 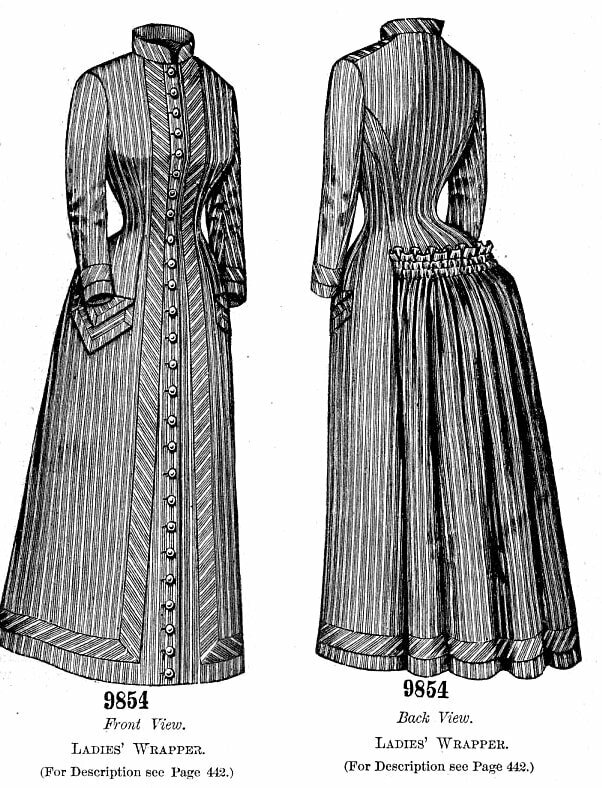 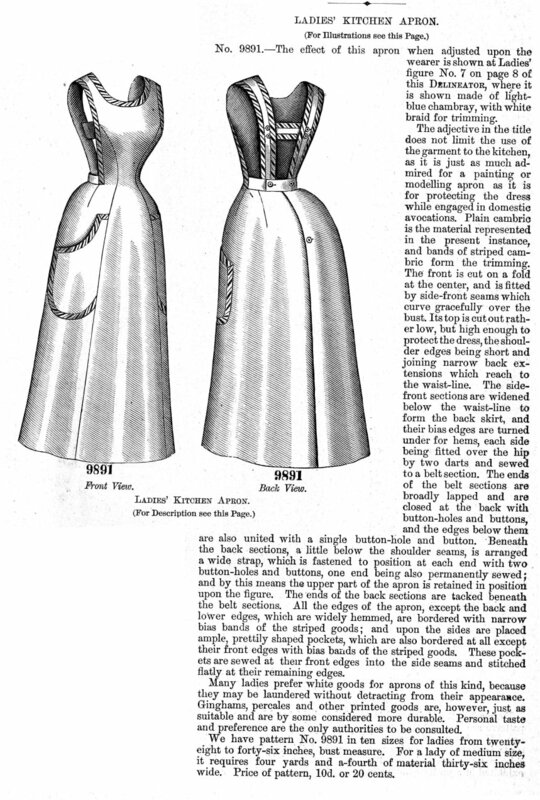 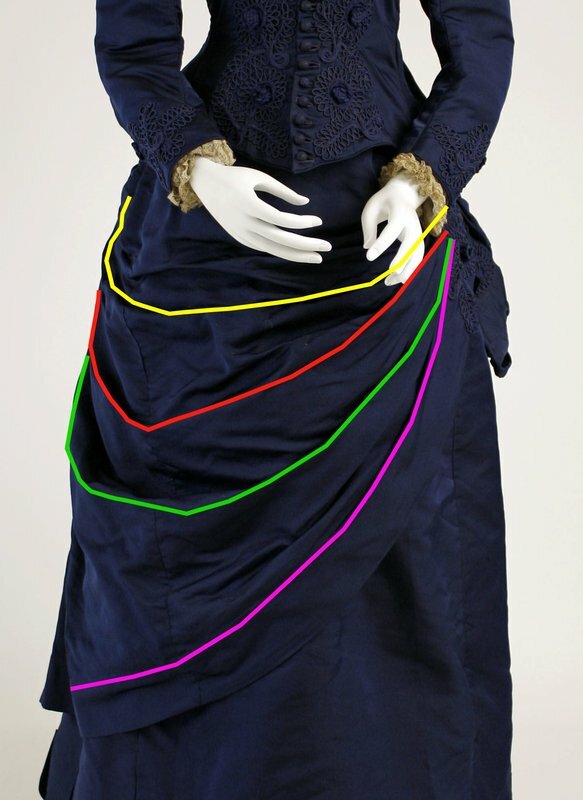 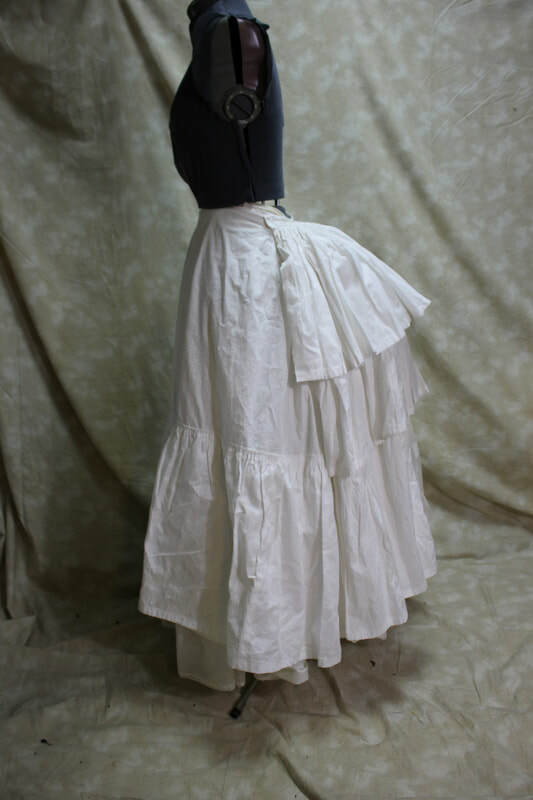 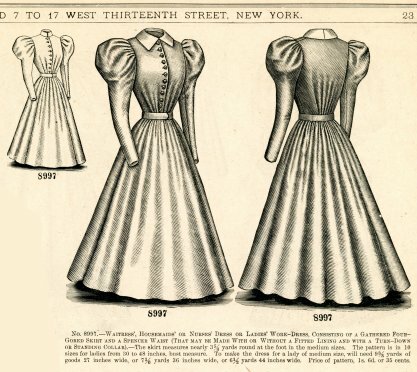 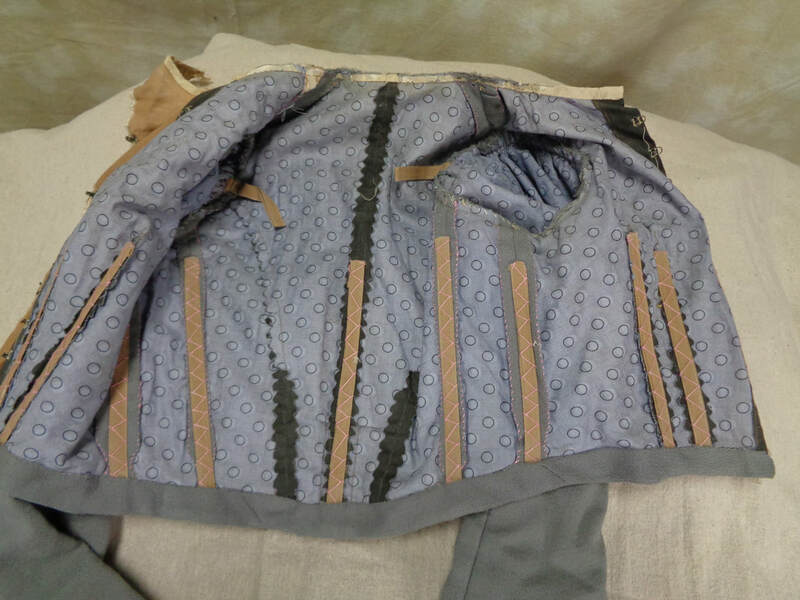 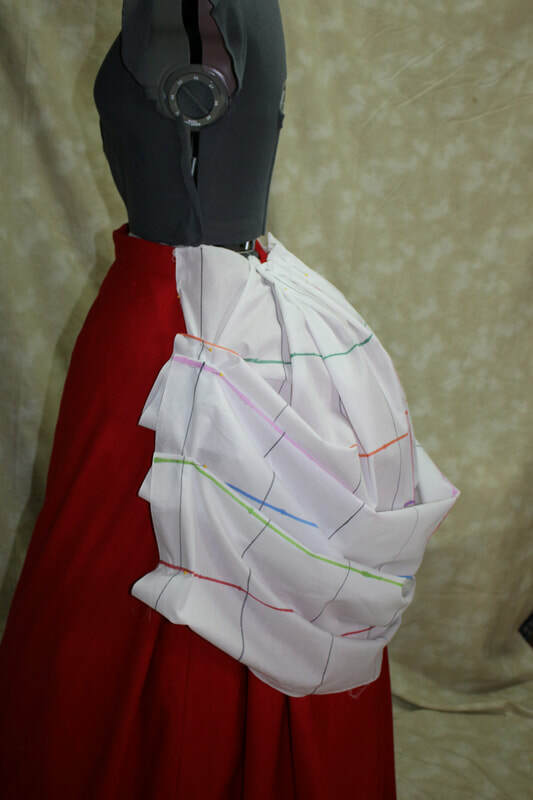 Cutting guides are included to shorten the shoulders to a more appropriate 1890's length, and for a gathered back, a pleated back and a gored back skirt. 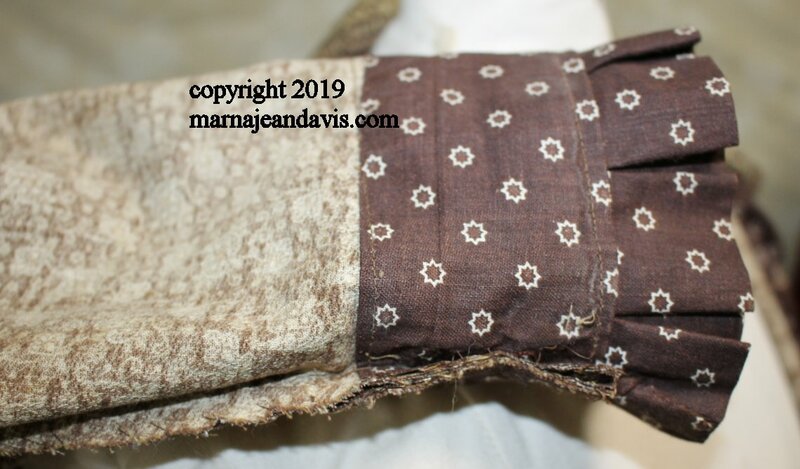 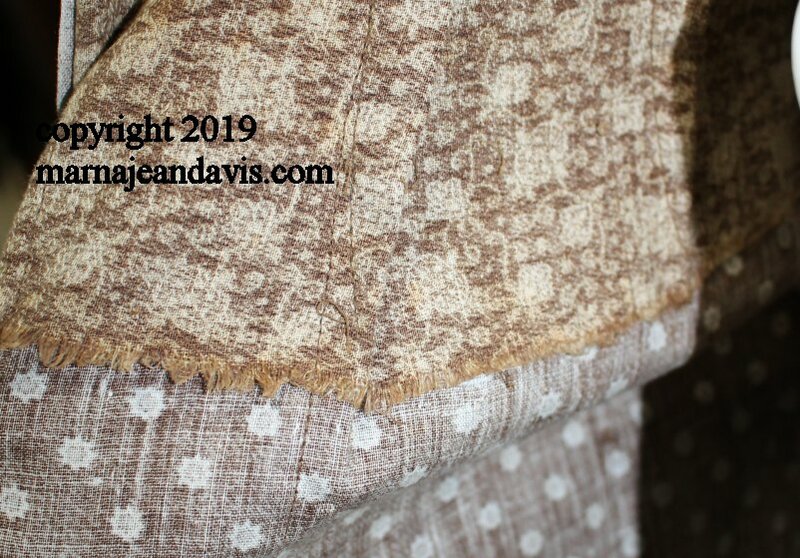 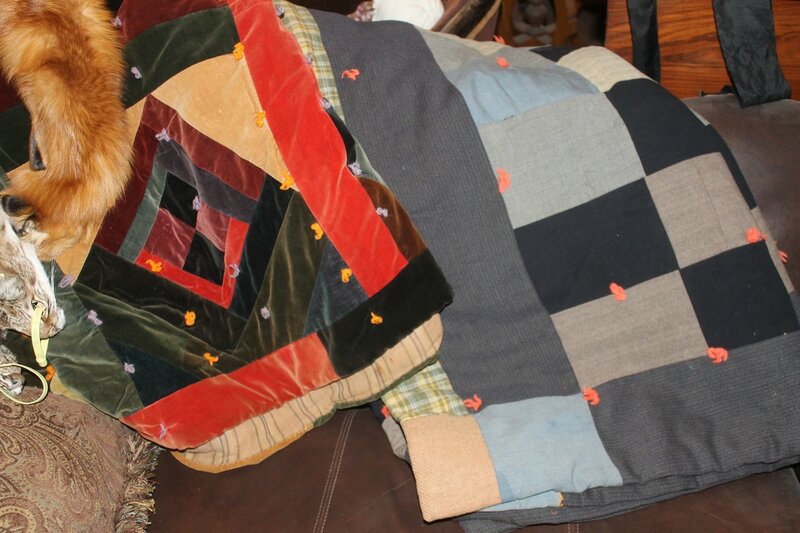 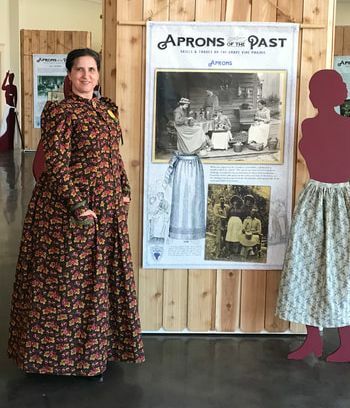 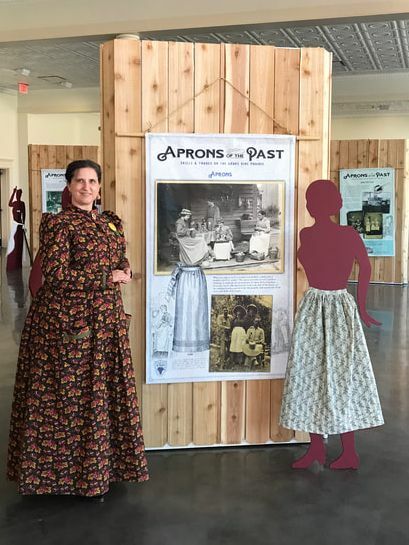 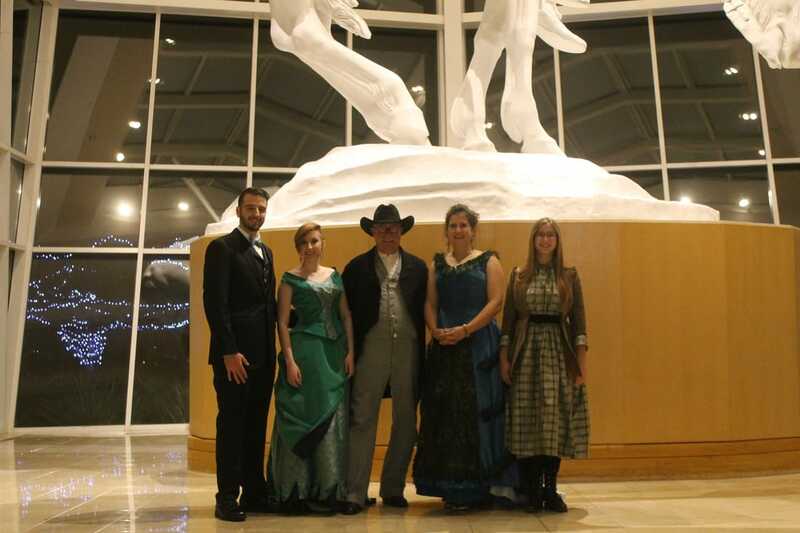 We gave the pattern a test run with a class of 13 people at the Texas living history conference the end of January 2019 and it was a rousing success. 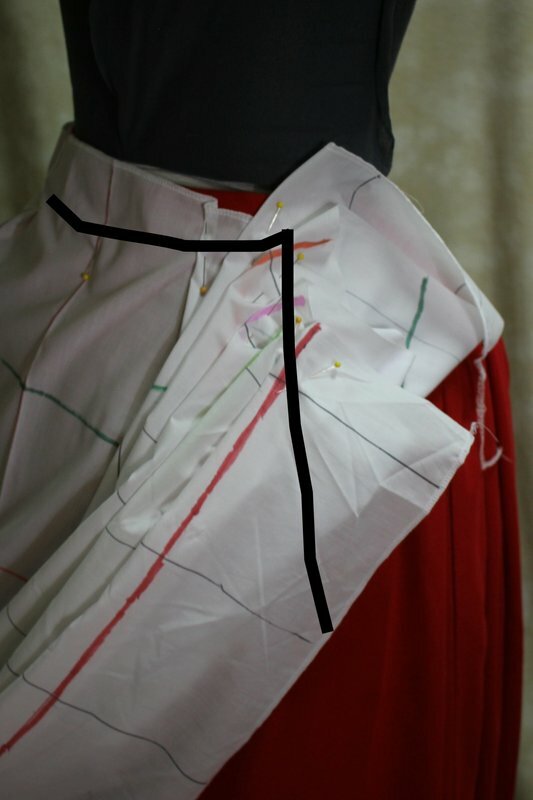 I came home and made minor pattern notes (mostly labeling cutting lines or stitch lines more clearly and started the final editing of pattern directions and the compiling of good historical notes. 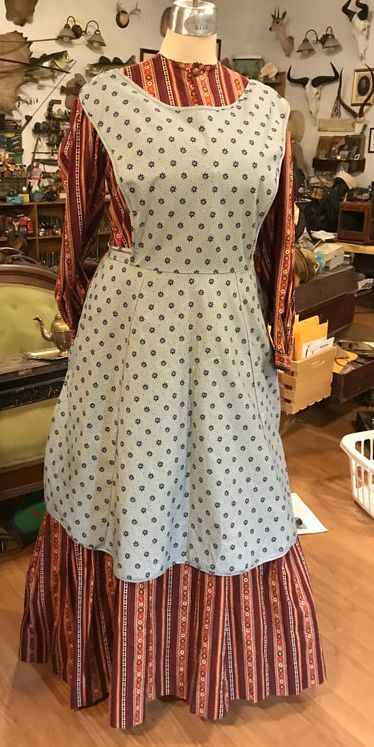 These are the two dresses I made for myself from the pattern. 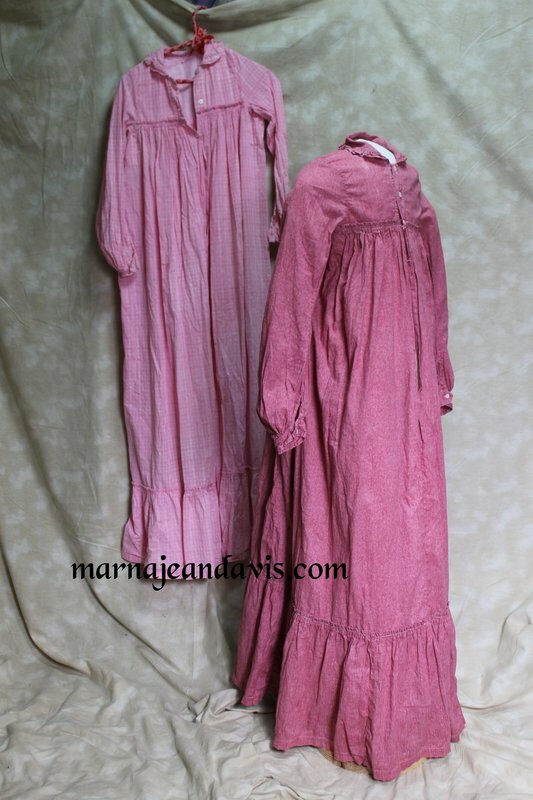 They are comfortable and I was so pleased when little girls ran up to me on the street in Grapevine TX telling me how pretty my dresses were!